We all love to hate the Colonel. But merchandising his client as a ‘brand’ was like striking gold. 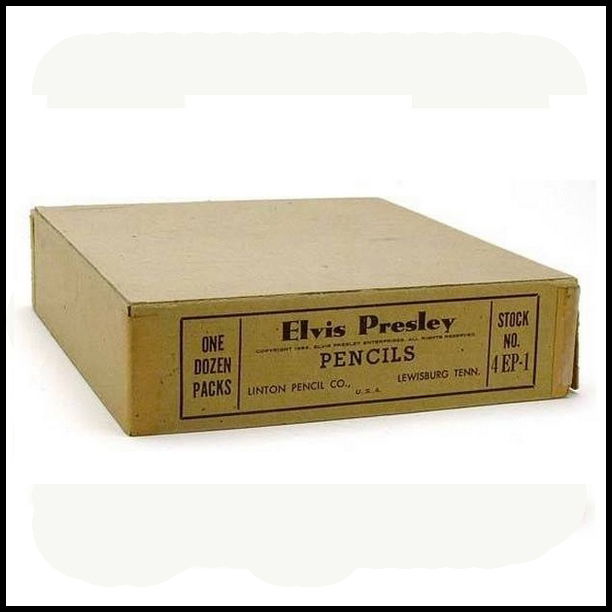 The commercial success of Elvis Presley Enterprises (E.P.E.) 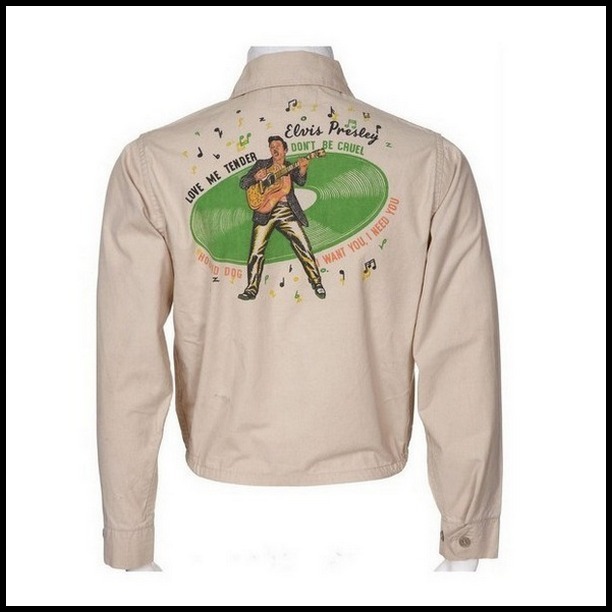 merchandise even outweighed that of Disney and the hugely popular cowboy stars of the day. 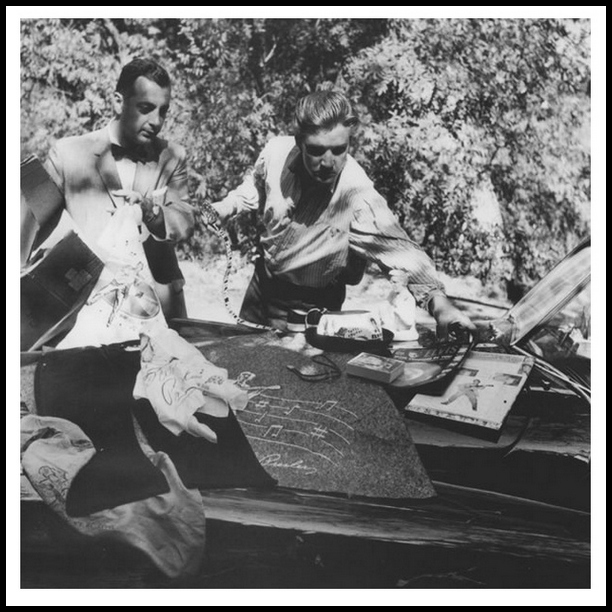 In this article I will try to bring together all pieces of vintage E.P.E. memorabilia, in the absolute best possible quality. And to make this article easy to navigate and search, I’ve chosen to list these items alphabetically. Since the collection is so big, it will be presented in two parts. 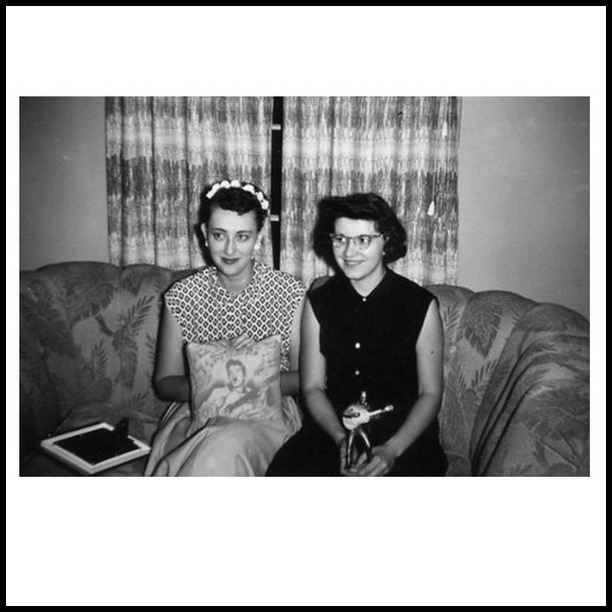 In PART ONE you will find the first 50 items (over 100 images). Enjoy the ride! 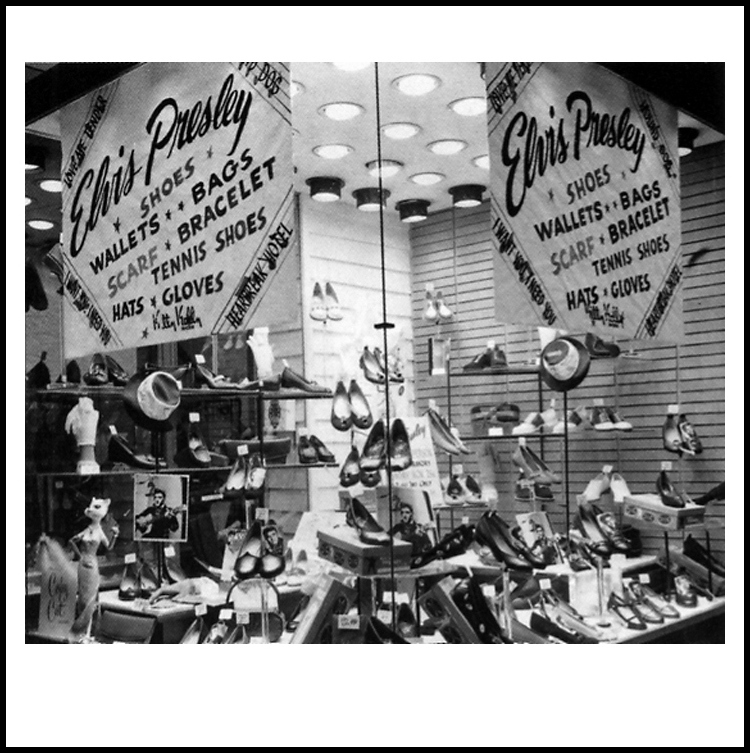 TO THE LEFT we see the window of a Shoe-Store in 1956, announcing the Elvis Presley products they have for sale, ranging from shoes to hats and gloves. 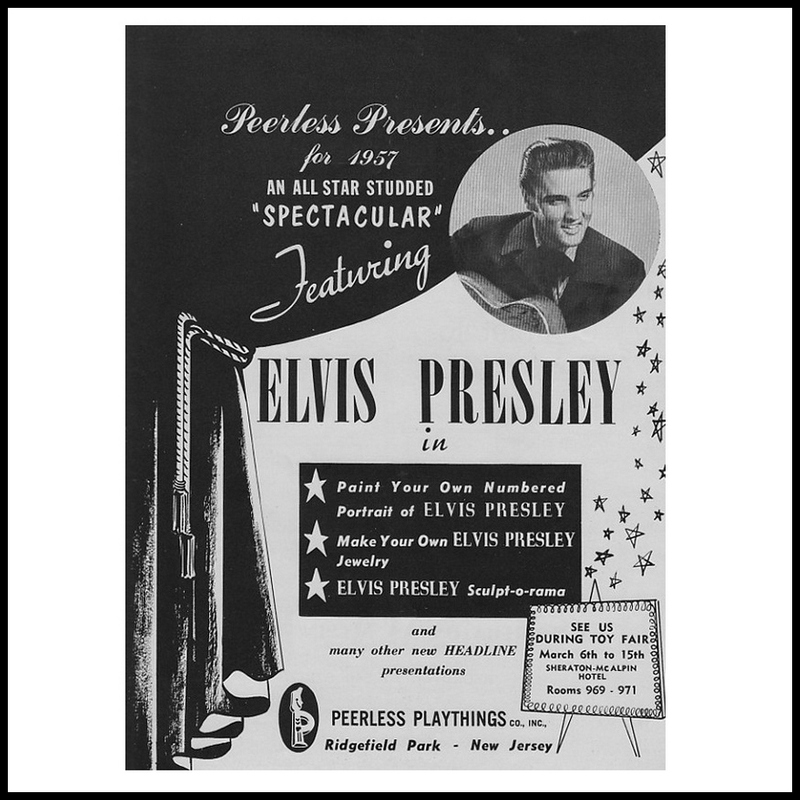 BELOW we have a very interesting article from Billboard magazine (September 29, 1956). This article gives us a perfect insight into how extremely big the merchandise campaign actually was. 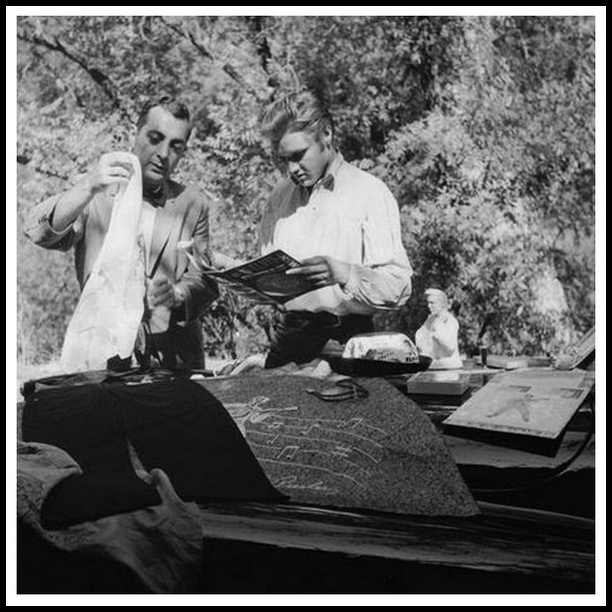 The man in charge of it all was Hank Saperstein, whom had already succesfully merchandised The Lone Ranger and Lassie among other brands. Saperstein estimated that the $ 20.000.000 sales mark would be reached before the year was over. At the time the article was published, hundreds of thousands of E.P.E. 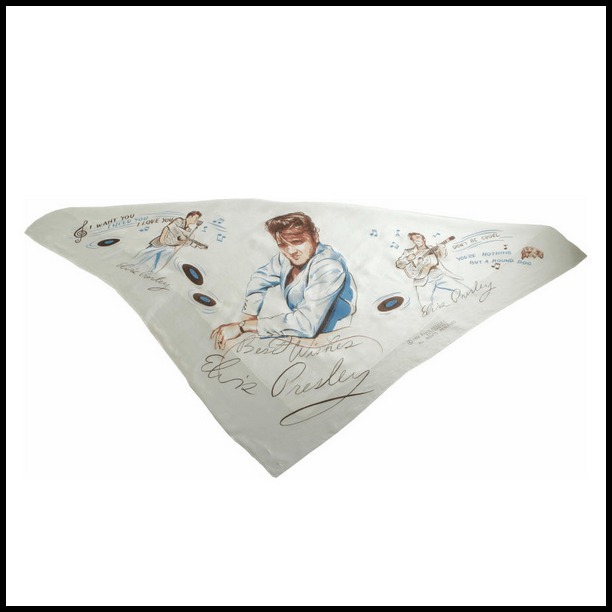 items had already been sold, and the only problem seemed to be that the production companies could hardly keep up with the skyrocketing demand for Presley merchandise. One of the reasons for the incredible success of the campaign could have been that all the large department stores (including Sears, Woolworth’s, Roebuck and Macy’s) kept stock of the E.P.E. merchandise. 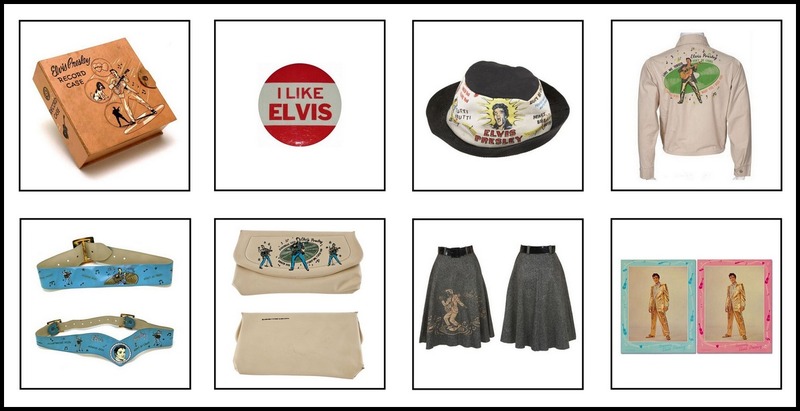 In the TWO PHOTOS UNDERNEATH the Billboard article, we can see Saperstein and Elvis (on the set of Love Me Tender) checking out part of the merchandise. Quite clearly visible are the E.P.E. blue jeans, the felt skirt, bolo tie, bookends and hat. 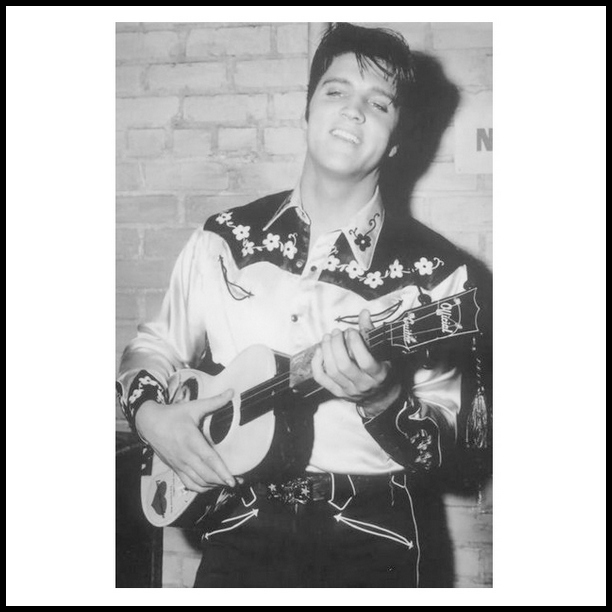 In the first image we see Elvis holding an E.P.E. belt in his right hand, while he is going through the Elvis Answers Back magazine in the second image. Is it an Ashtray, is it a Coaster? Well, it is collectable, that’s what it is! From the image you might get the impression it’s quite a large piece, but in reality it’s only 3,5 inch in diameter. 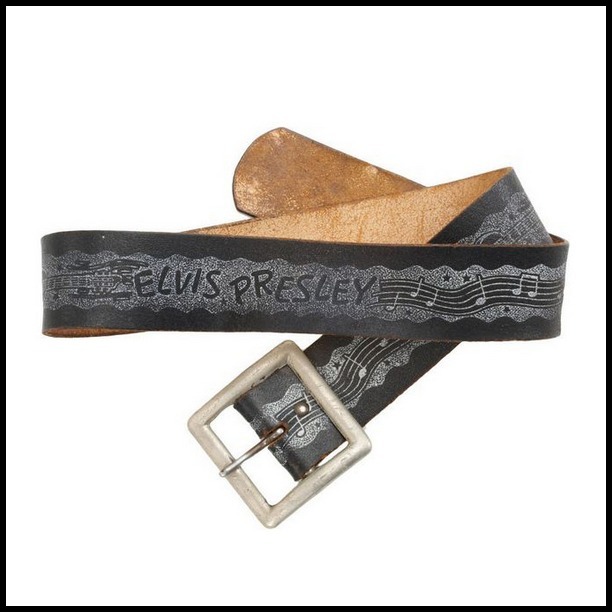 Here we have the rather cool black Leather Belt. And to the right we see one of at least two different Belt Buckles that were available in 1956. 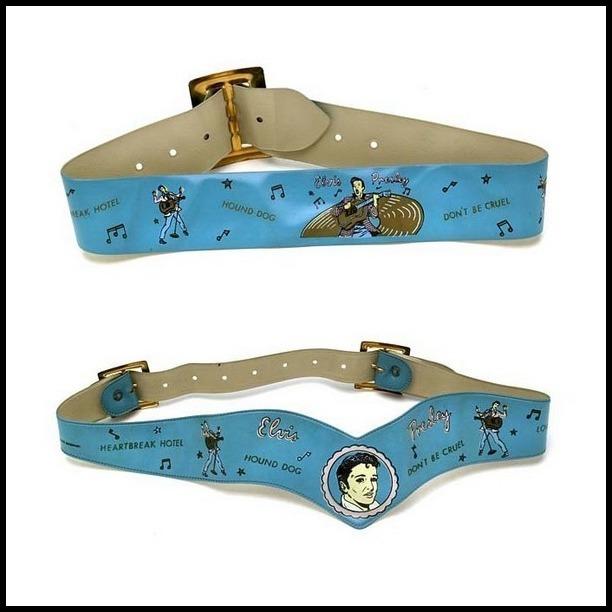 These Plastic Belts came in two different styles, and in many different colors. 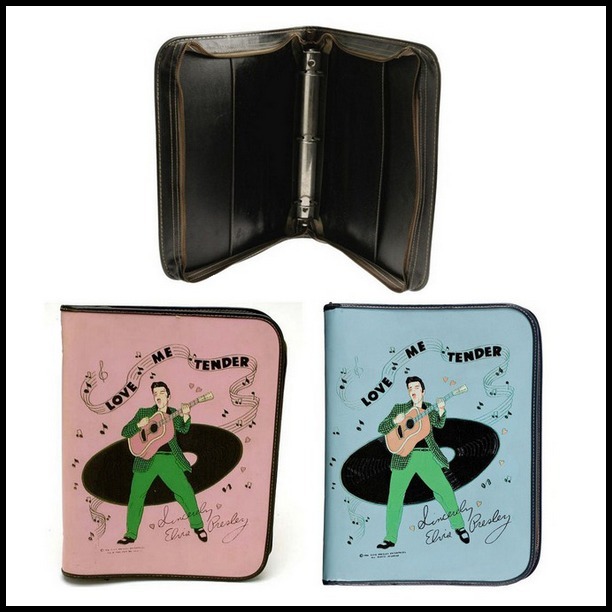 These colors perfectly matched the colors of the Wallets/Purses E.P.E. put out at the same time. 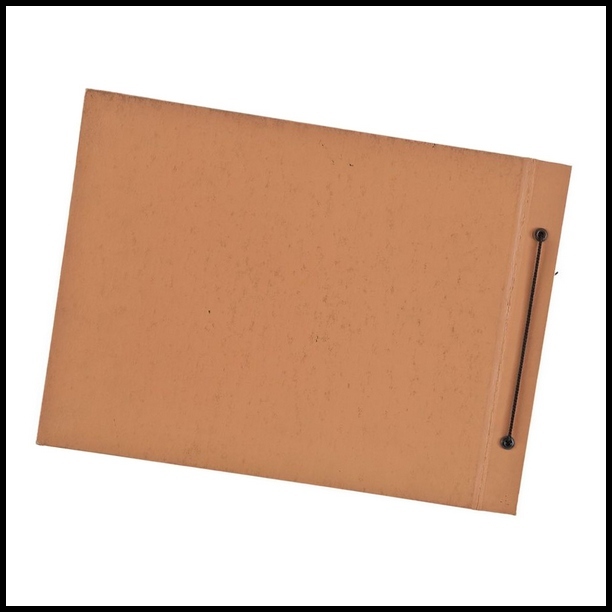 This zippered 3-ring Binder was available in at least three colors. 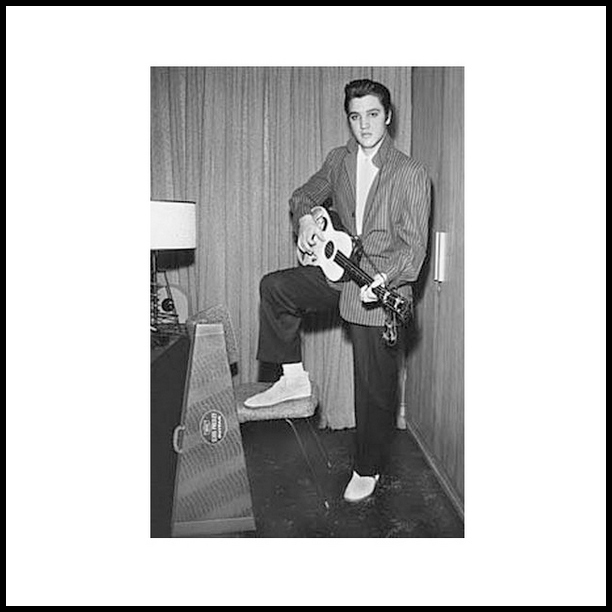 framed photo of Elvis, the other one had a guitar. 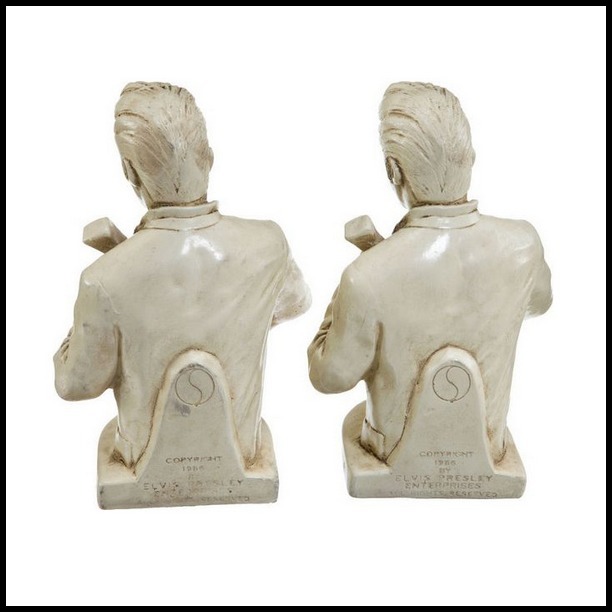 Apparently a lot of fans did not use these Bookends as …, well, bookends, but rather displayed them as if they were Elvis busts. And why not? These are not that easy to find nowadays as a pair. 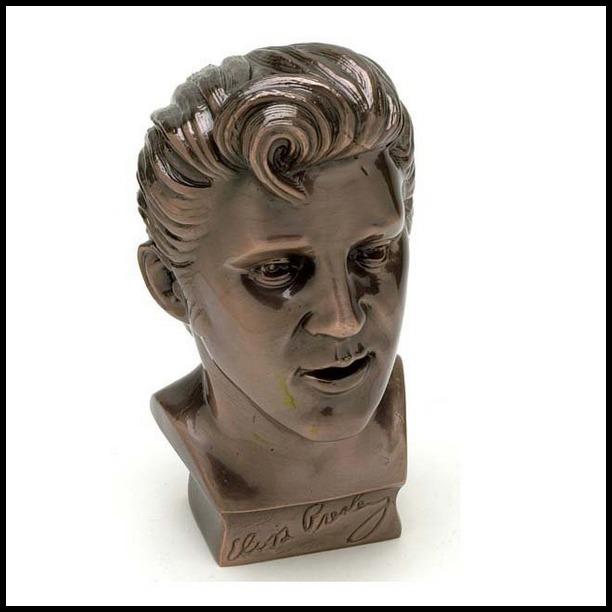 This official Elvis Bust came in two colors, and I believe this is the only E.P.E. product manufactured in 1961 and the last of the vintage E.P.E. merchandise. Notice how the hair is an exact copy of the ’56 Bookends, and especially the sideburns were very much a thing of the past by 1961. 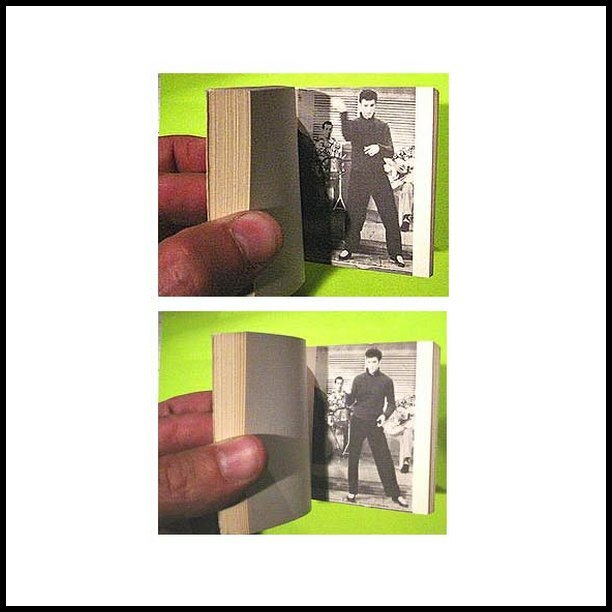 Shown here is the one year version of the Elvis Diary. It was also available in a three year version. 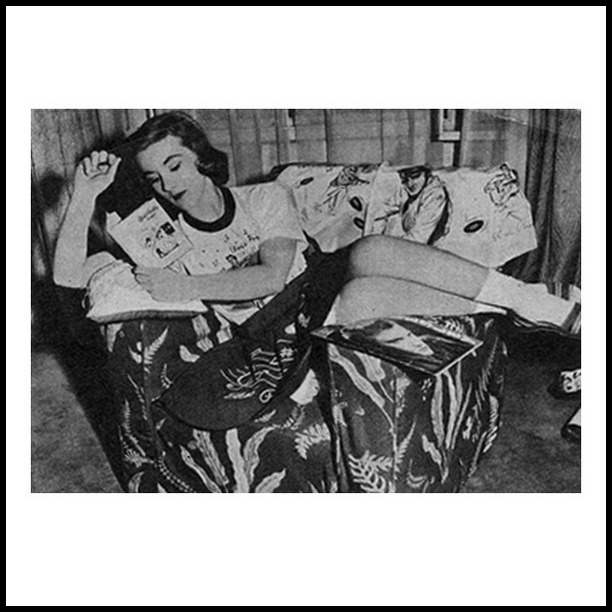 Besides holding the Diary, the girl in the photo is also dressed up in E.P.E. wear (T-Shirt + Skirt) and a Pillow and Scarf are visible as well. 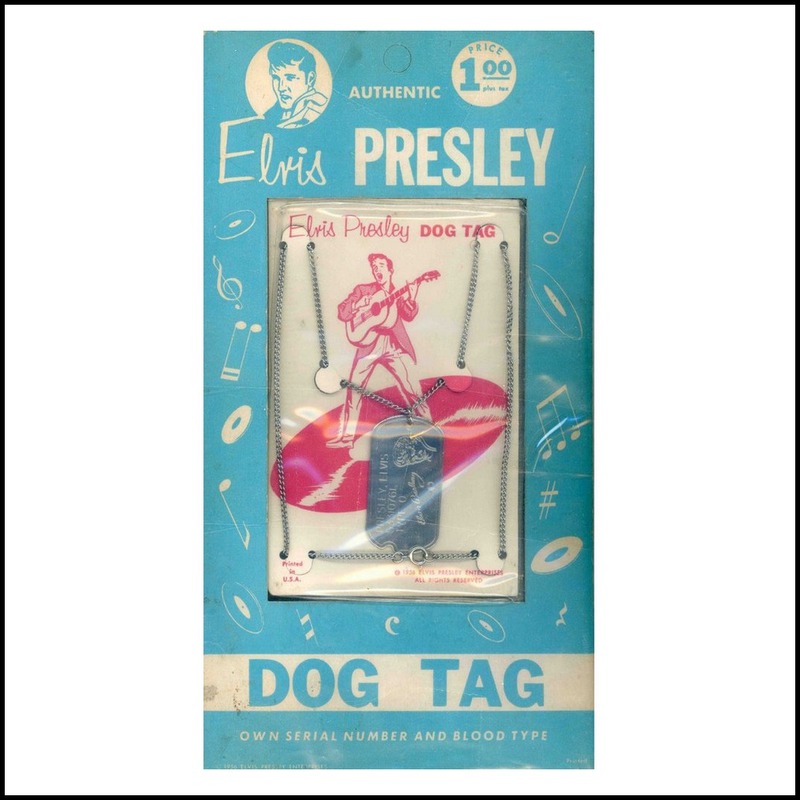 The copyright date on all the different pieces of Dog Tag merchandise says 1956, but these were actually manufactured in 1958. 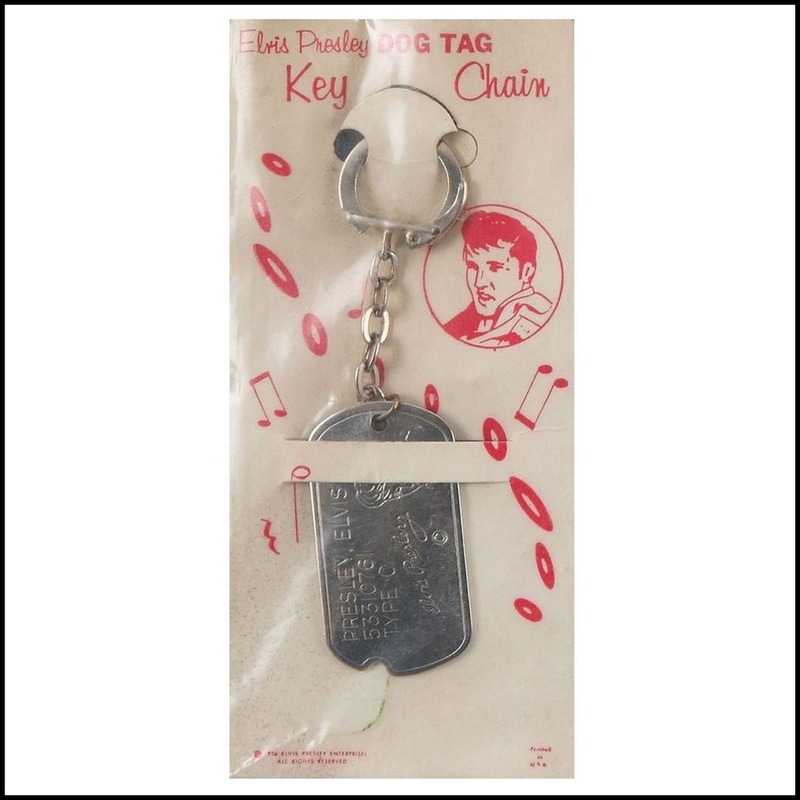 The tags shown here have Elvis’ army number printed on it. Left we have a Dog Tag Necklace, and right the Dog Tag Key Chain. One of the rarest vintage E.P.E. items is this 18 inch tall Elvis Doll. The materials used to manufacture the doll rather quickly deterioted over time (unless well taken care of), making it the most sought after piece in the original E.P.E. series. Especially in it’s original box, this one is almost impossible to find. 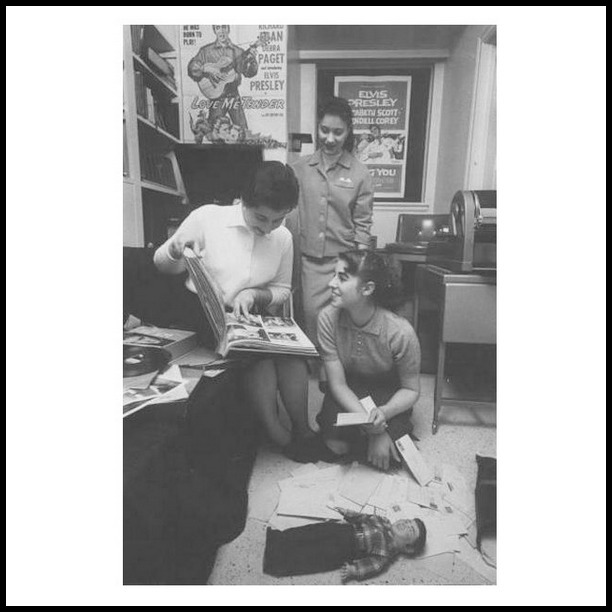 The girls in the photo check out a Scrapbook. 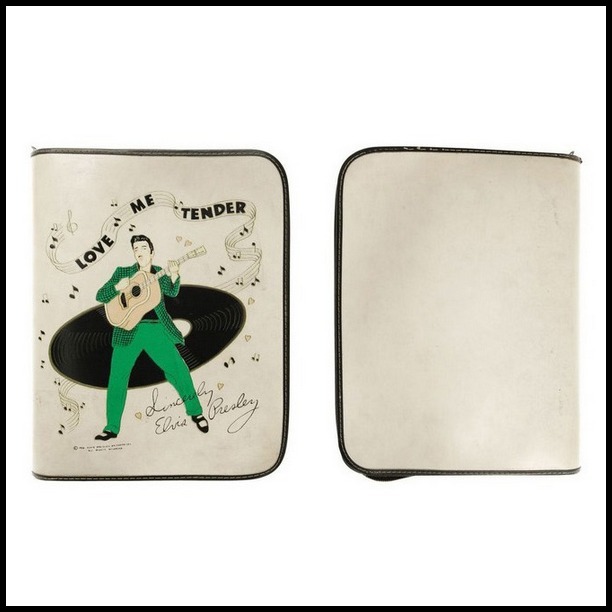 We can also see the Record Case, plus 1-sheet posters for Love Me Tender and Loving You. While all this time the Elvis Doll is minding his own business in the foreground of this cool picture. Today, just about every famous entertainer has an own fragrance on the market. 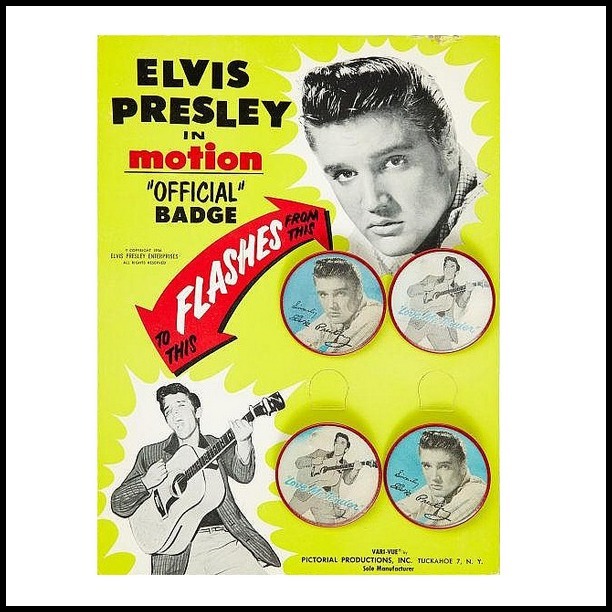 But back in 1956 it was kind of special to be able to buy an Elvis Presley Perfume. 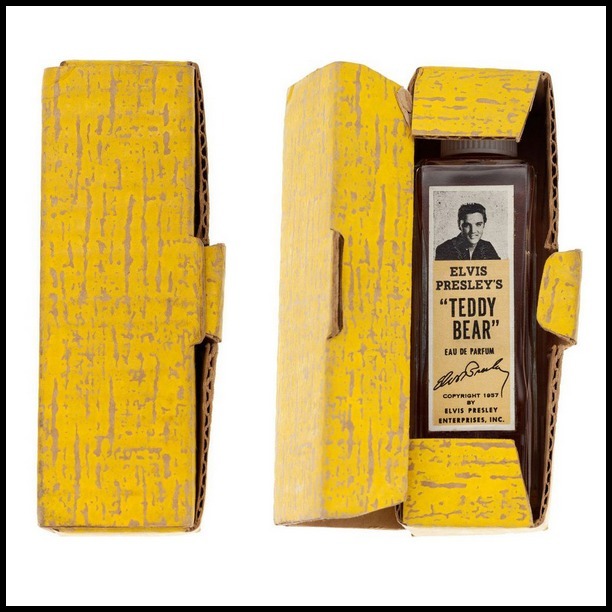 In the 60’s the Teddy Bear Perfume was updated: the shape of the bottle had changed, and also a new and more recent image of Elvis could now be seen on this product. This Flasher Pin was a cool gadget! 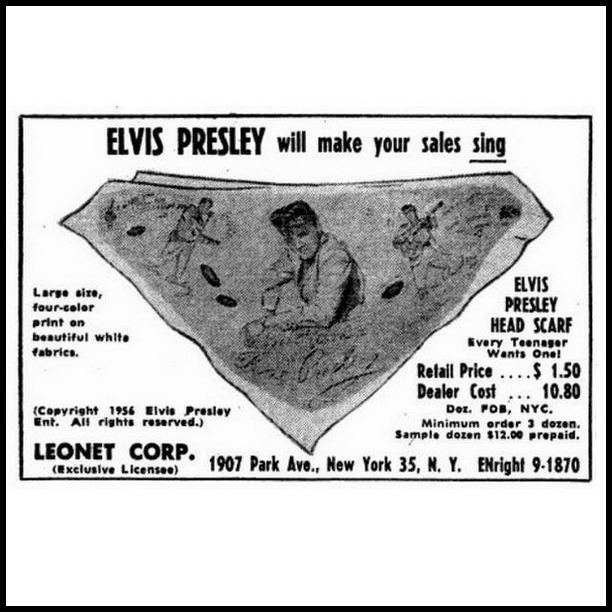 The ad the the right is from Billboard (December 22, 1956). 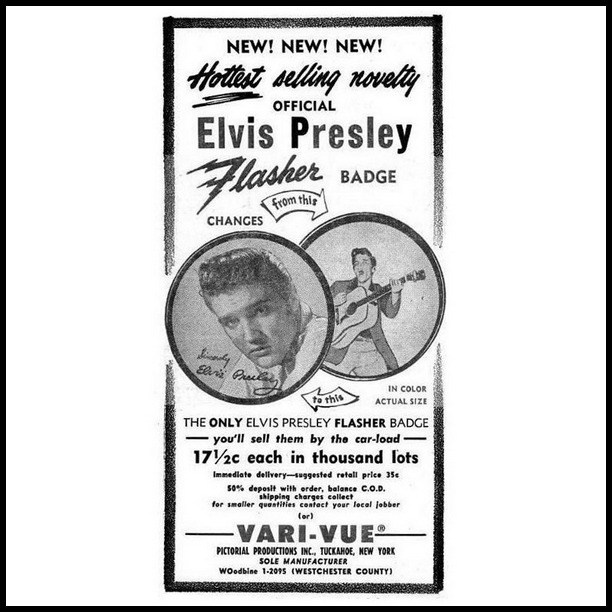 Below we see a different Billboard-ad (from December 8, 1956) for the Flasher Pin. And also some clear examples of different images used for this pin, as well as the larger variant, including their back-side. Interesting is also the proof sheet of 9 unused flasher buttons still part of the original thick plastic board. 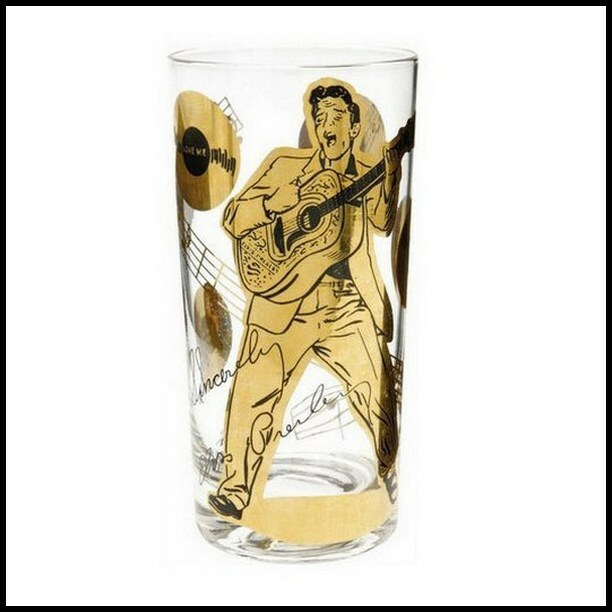 You could pour yourself a double shot of Elvis’ love in this official Glass. Or just a diet-coke of course. 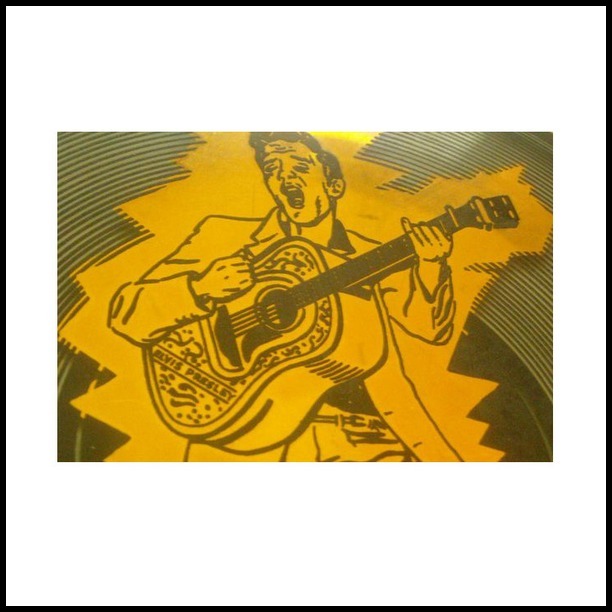 This Glass Plate matches the E.P.E. Glass. I have never seen an image of this plate in it’s original box, but I’m sure it would be a treat to witness this. couple of hours after the lights went out. One of the most famous E.P.E. 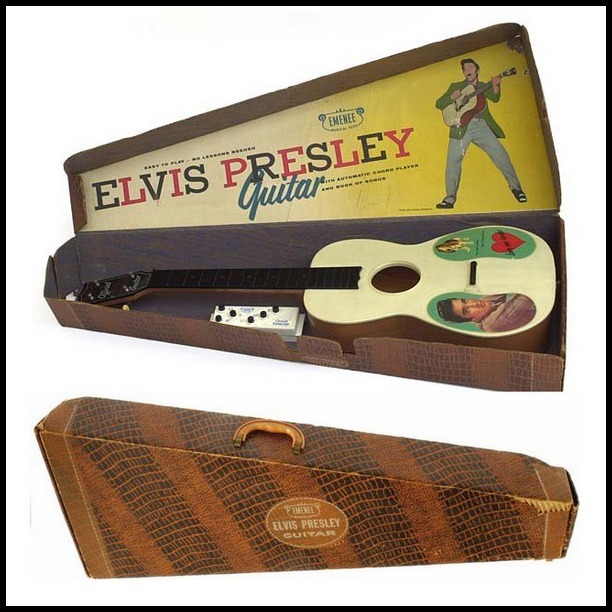 products: the Elvis Presley Guitar. It was available with four and six strings. A Chord Player (that can be seen in the image to the left) and a small Songbook were included with the package. In the picture to the right we can see that the Carrying Case measured around 3 feet. Here we see two pieces of the guitar in more detail. The photo to the right was taken on the set of Running Wild. 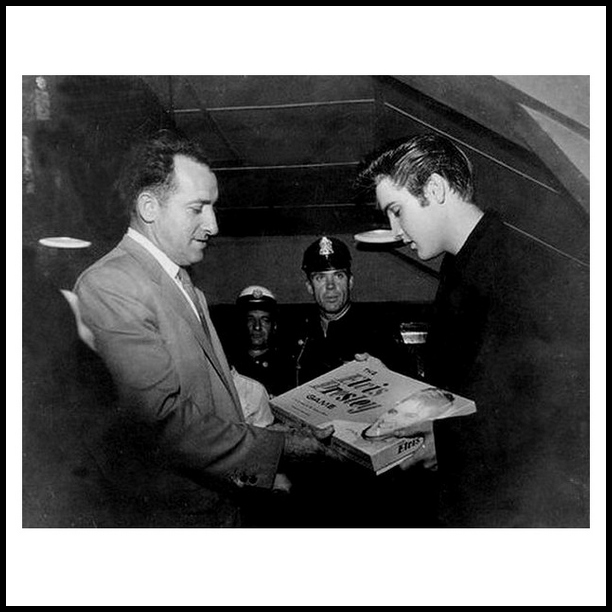 Other pics of this day of Elvis with the E.P.E. guitar exist. 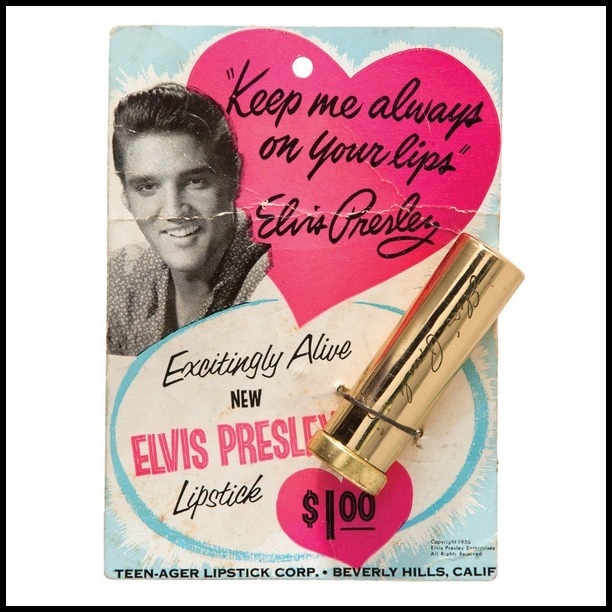 blow your nose in Elvis. 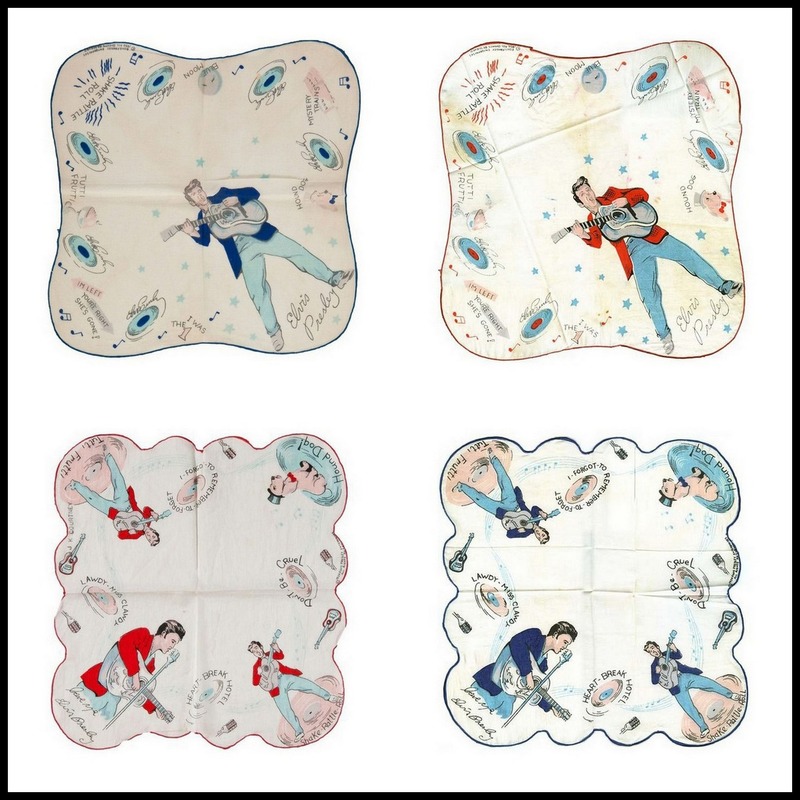 The Handkerchiefs came with different images and in different colors. Certainly one of the most popular E.P.E. items, this Hat can be seen in a lot of pictures from those years. To the right we see the hat with the original tag still attached. 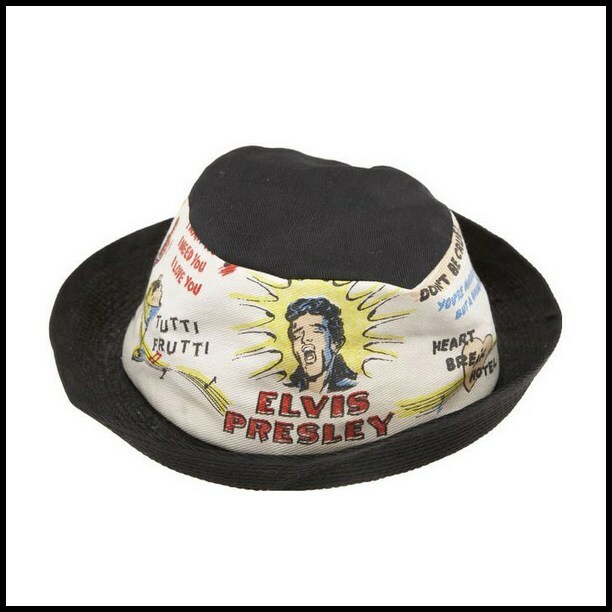 The hat was later (in ’57) available with a different tag, this time promoting Loving You. 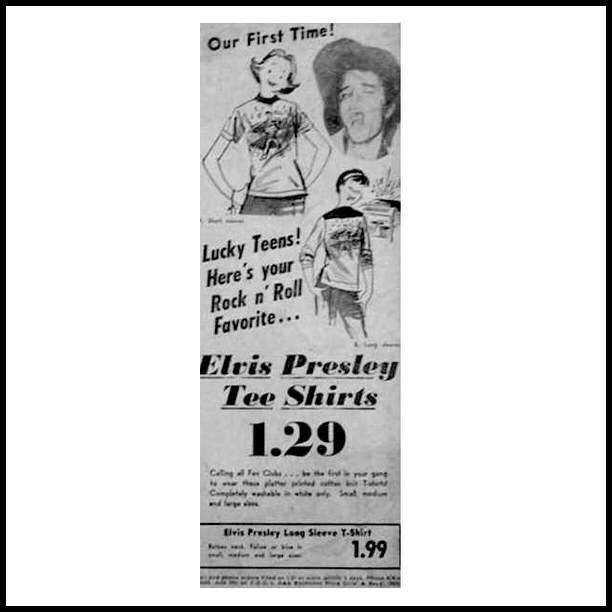 And below we have two nice store-ads, as well as some images from the Welcome Home Elvis shows in Tupelo. Elvis’ girlfriend Barbara Hearn can be seen in the background of the middle picture. This Headscarf is similar to the regular Scarf (further down in this article) except for it’s shape of course. 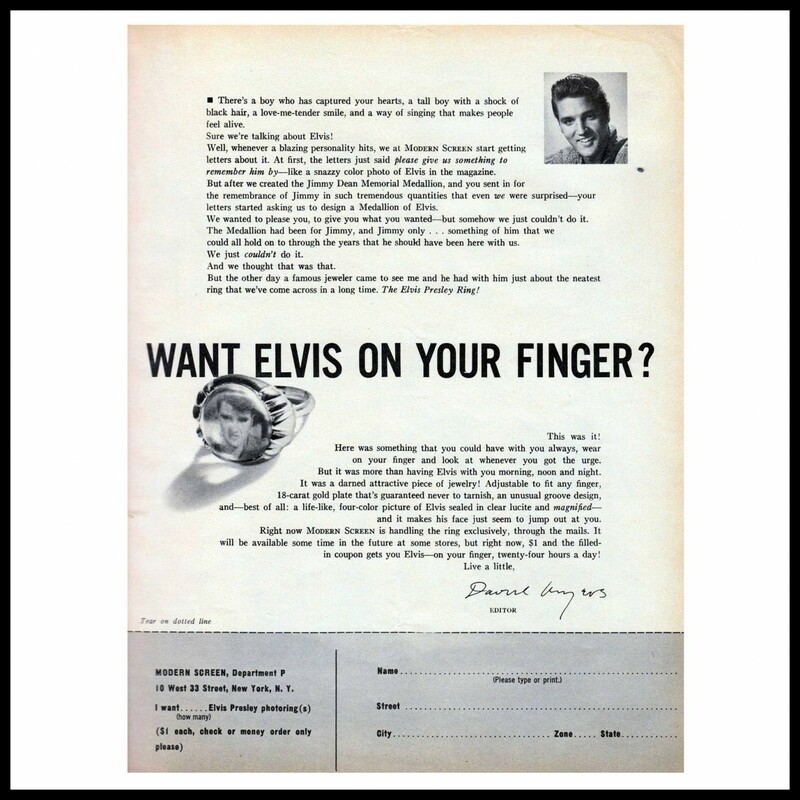 The ad to the right is from Billboard (November 3, 1956). * use her Elvis-Mittens (not kidding!) to put the hot food on the table using this Hot Plate Holder! 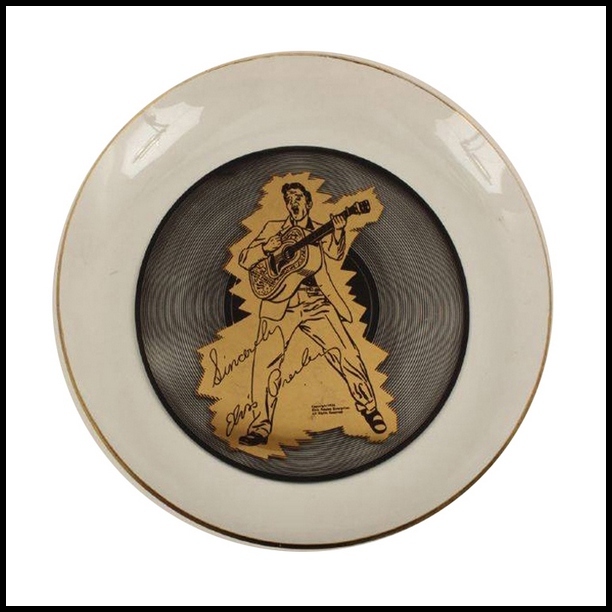 Since this 6 by 6 inch ceramic plate came with a hanging mechanism on the back, many a fan would have probably used it as wall-decoration. 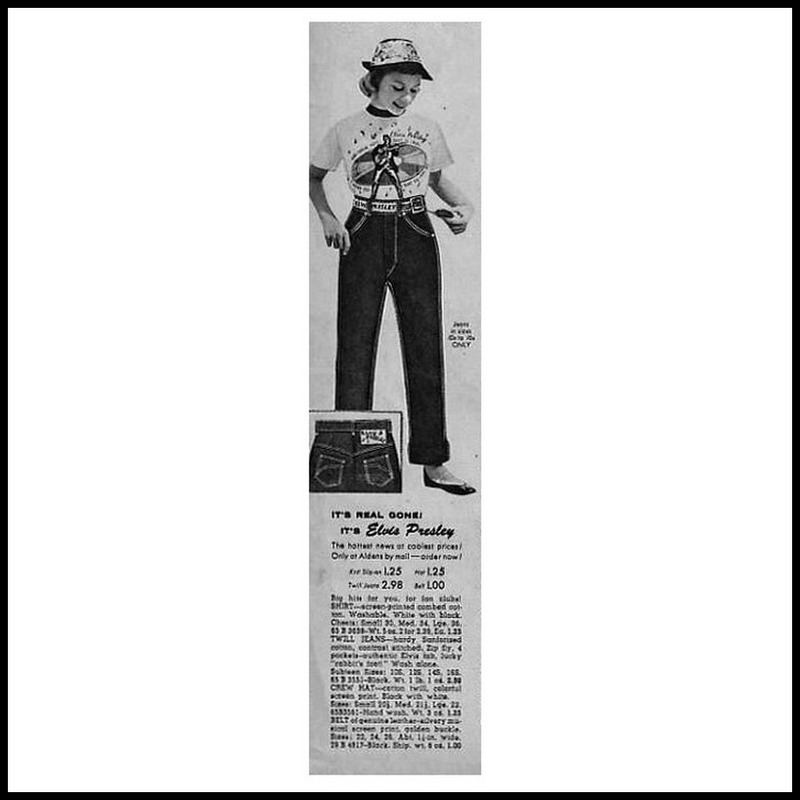 If I would have been around in mid 50’s America, THIS would have topped my wantlist (with the black leather belt in second place)! My absolue favourite of all the vintage E.P.E. merchandise. 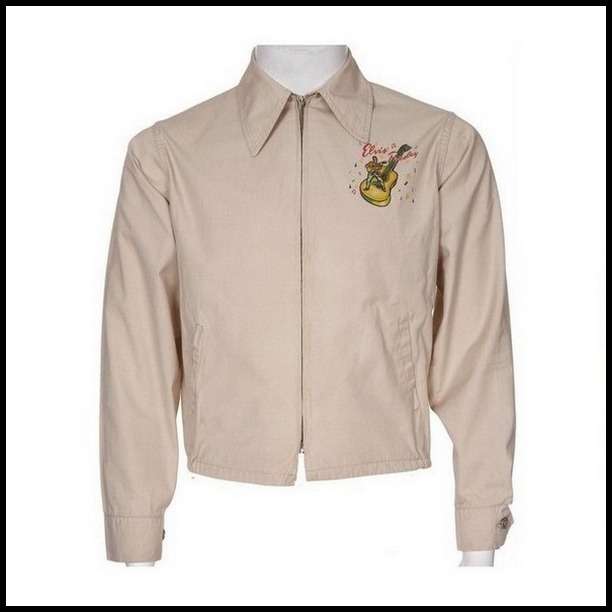 This cool cool Jacket probably did not sell very well in 1956, since it might have been one of the most expensive items in the E.P.E. range. Maybe this is why we hardly ever see this item turn up in auction nowadays (in fact, I only saw it once). From the impossible to find Jacket to the just as impossible to find pair of Blue-Jeans (which were actually black) is just a small step. To the left we see the original tag of the jeans, and to the right we have an ad. But that’s about it. Apart from a low-rez image in one of the collector books, I never saw this pair of jeans on the web anywhere. 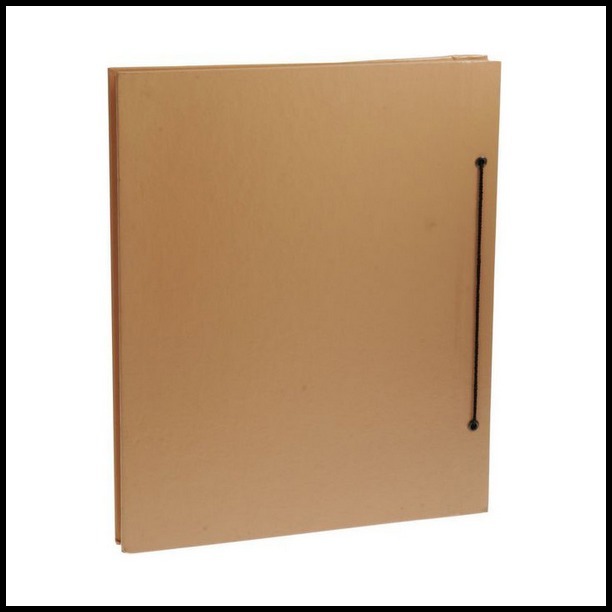 Here we have a Flip-Book. If you went through the pages fast, you could see Vince doing part of the Baby, I Don’t Care dance-routine from Jailhouse Rock. 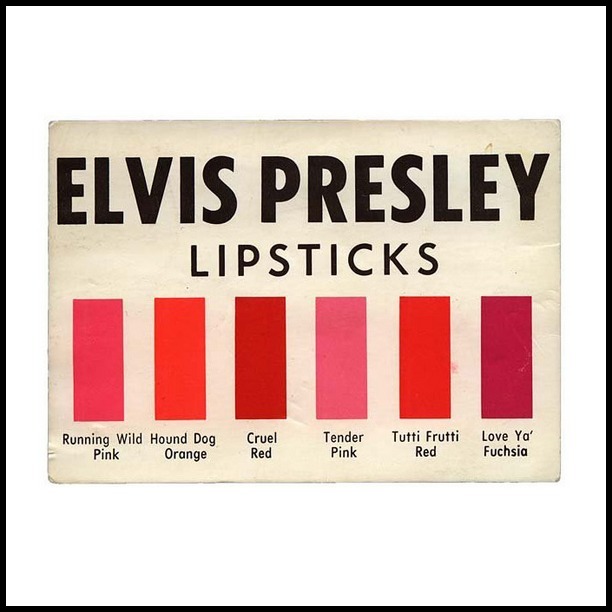 The Elvis Presley Lipstick was available in 6 different colors, of which Running Wild Pink is the rarest variation. 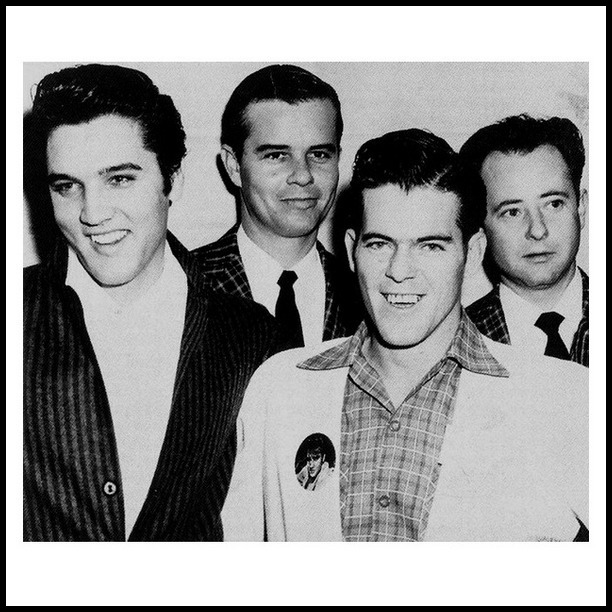 Running Wild was the title for Elvis’ upcoming new movie (which eventually became Loving You). Ed Sullivan referred to this movie as such during Elvis’ final appearance on the show. Below we see one of these lipsticks is full detail. 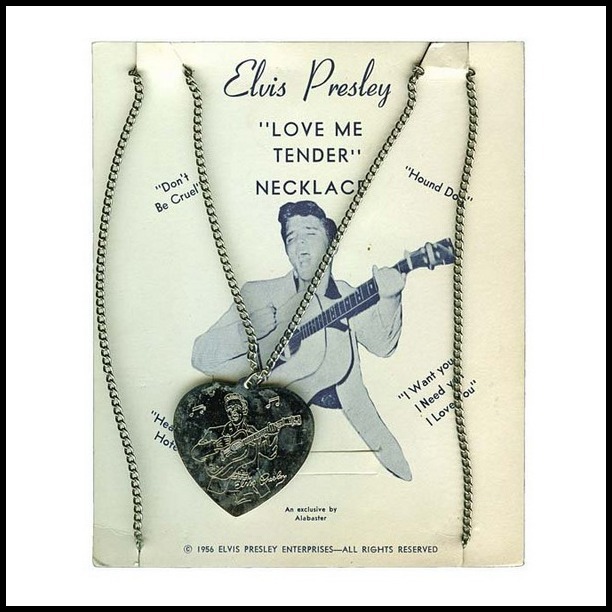 The Love Me Tender Necklace was manufactured in both silver and gold. 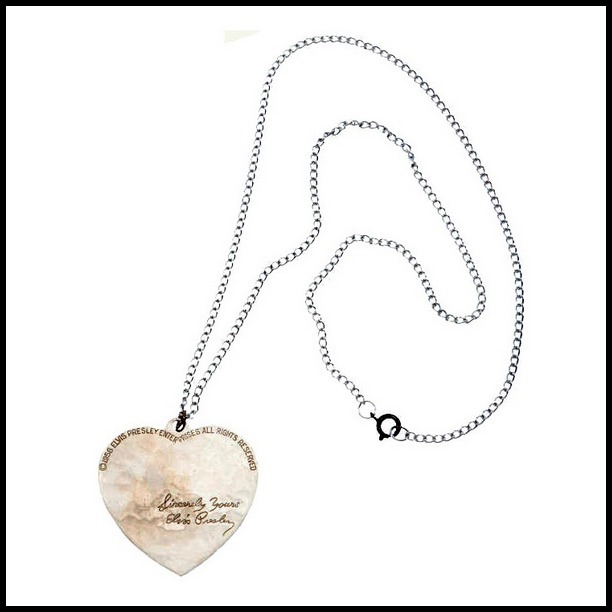 Scroll down this article, to the Short-Sleeved T-Shirt, to see this necklace in ‘action’. The Overnight Case was availbale in an least two colors, blue and brown. Below we have this case in detail. 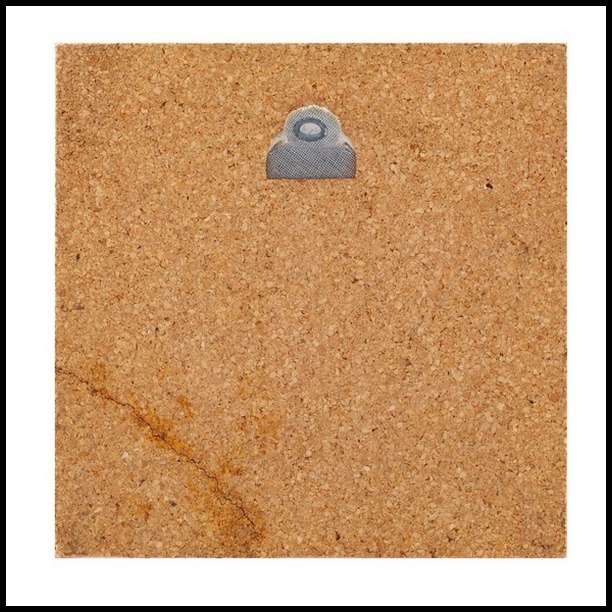 Another near impossible to find piece of E.P.E. 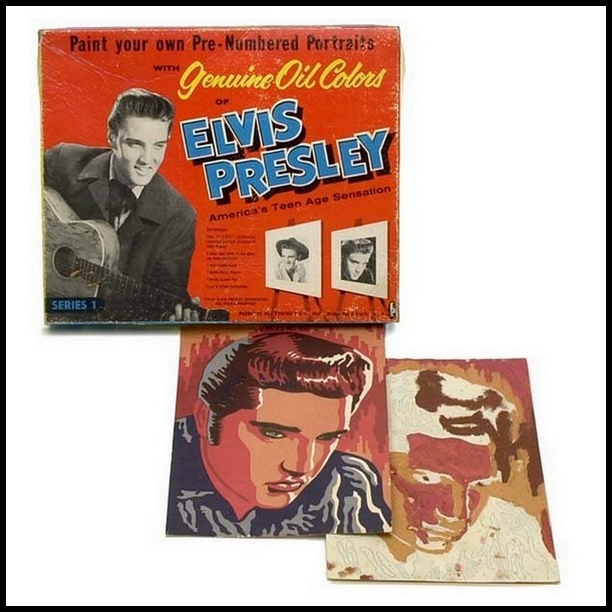 memorabilia: the 1957 Elvis Presley Paint Set. Ger Rijff did a short but interesting article on this set for Echoes, check it out HERE! 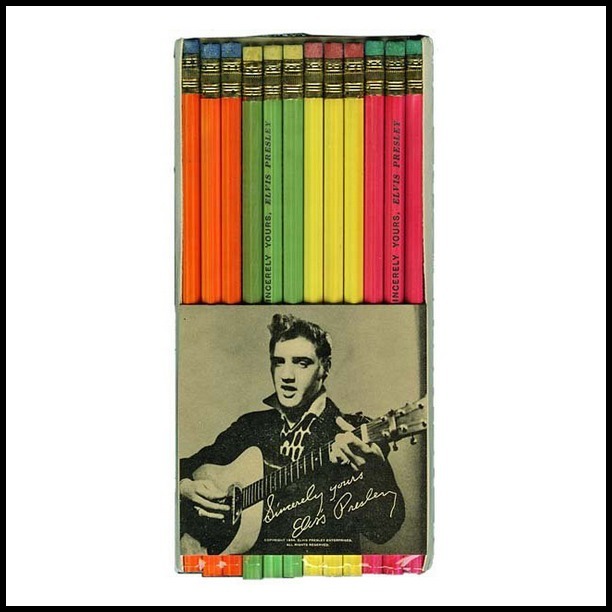 The Pencils had “Sincerely yours, Elvis Presley” printed on them, and they came 12 in a pack. To the right an original shipping carton (that would hold 12 sets of pencils) for this item. 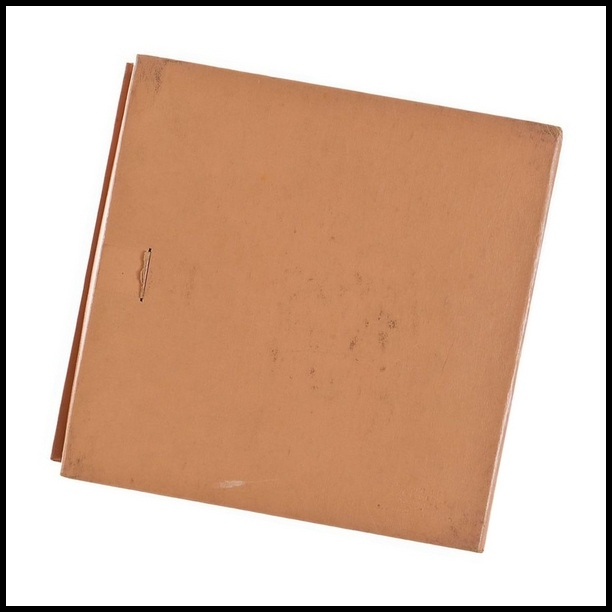 The Photo Album measured 10 by 14 inch. The E.P.E. 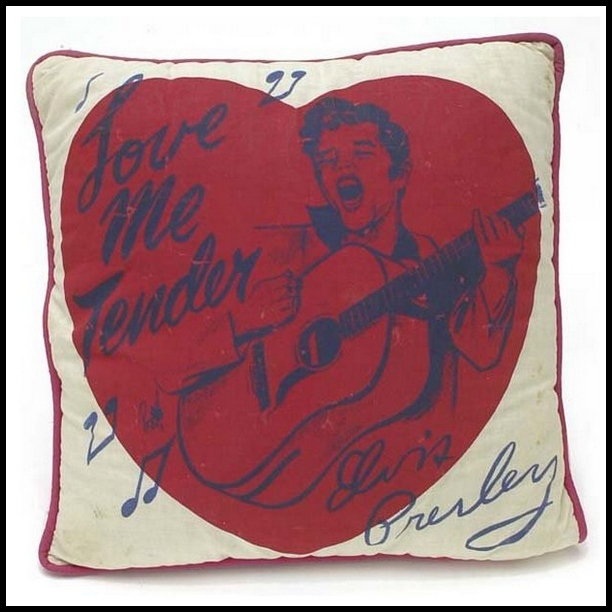 Pillow was available in many different designs. 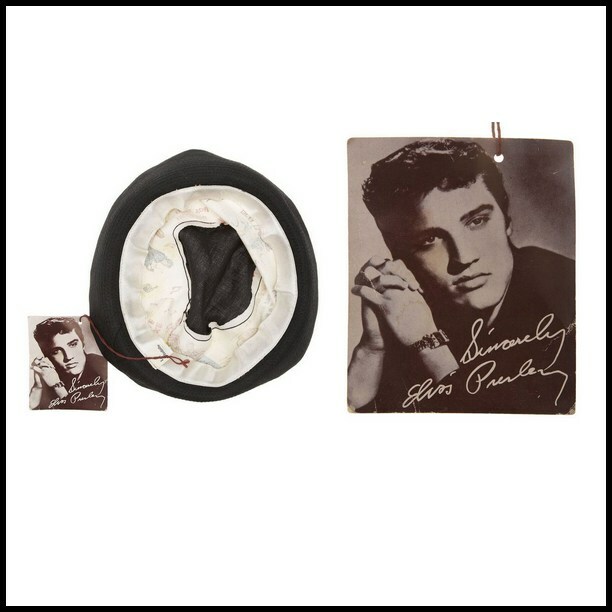 In the photo to the right, next to the Pillow, we can also see the Elvis Presley Statuette (scroll down this article for a clear image of this item) and a plastic framed E.P.E. 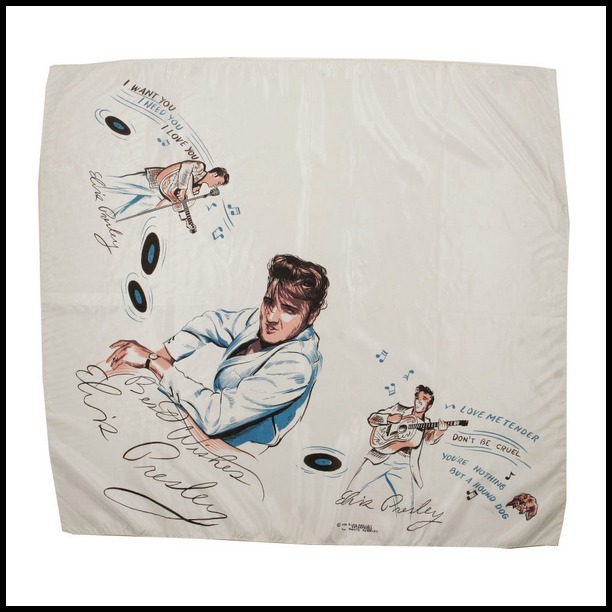 licensed picture of Elvis (laying face-down on the couch). 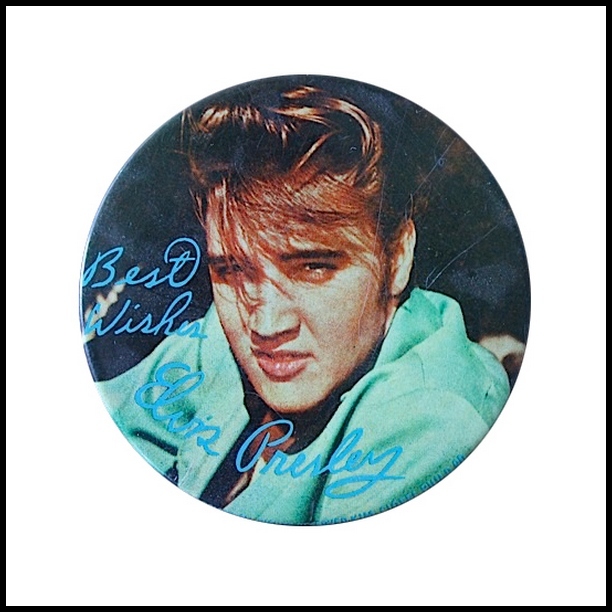 This Pin was available in different sizes, as well as with and without the “Best Wishes” and autograph on it. 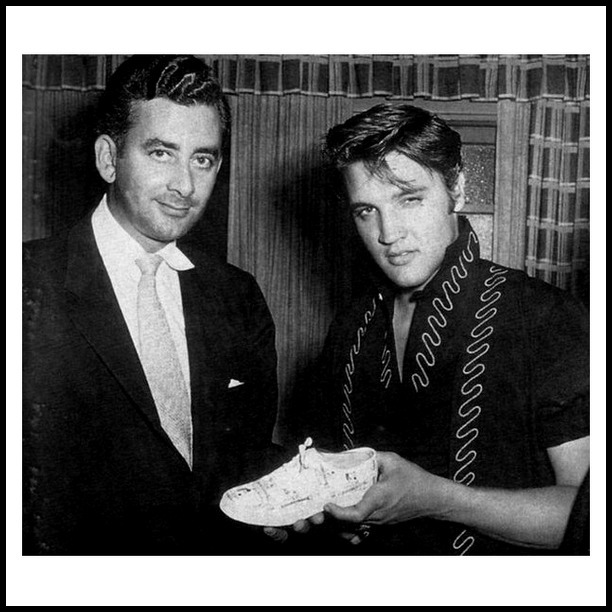 On the photo to the right we see Elvis with Tommy Blake (December 15, 1956). A nice photo of the Colonel wearing the same button also exists. 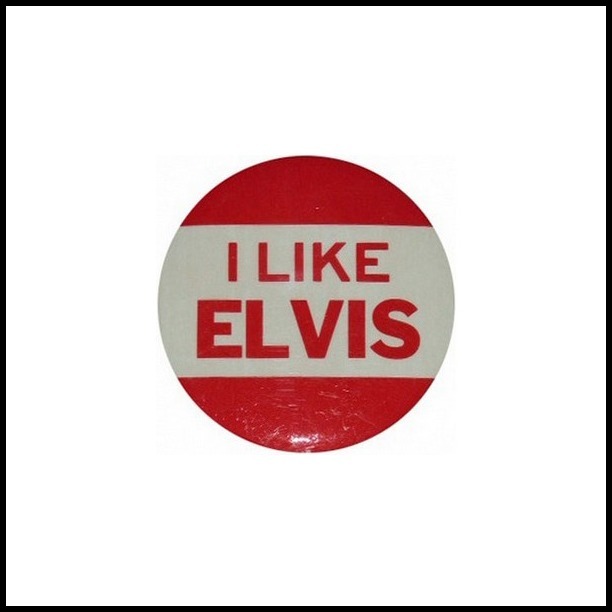 Probably because of it’s low price, this large I Like Elvis button was a very popular item in the 50’s. 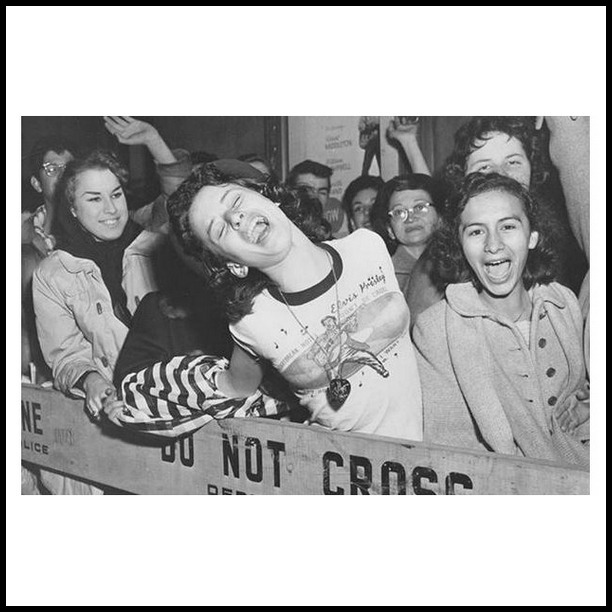 Many photos from concerts exist that show female fans wearing this button. Below are some nice examples. 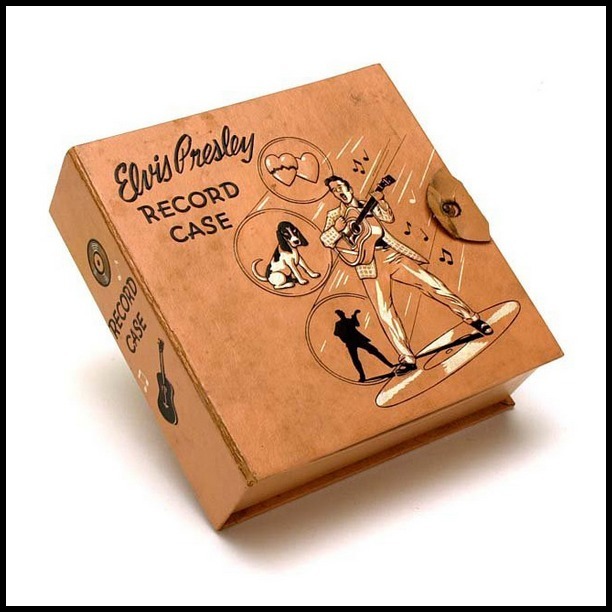 Measuring nearly 8 by 8 inch, this Record Case must have been a good seller for E.P.E. It’s also one of only a few E.P.E. items that was not striclty aimed at the female public. The gold-plated adjustable Ring is quite rare nowadays. And the 1956 Display Card still holding all 12 rings will easily set you back two grand. Below we see the display, as well as the ring, in more detail. The larger sister of the Headscarf: the regular Scarf. The photo to the right was taken during the unveiling of the giant Elvis cut-out on NY’s Times Square, on October 28, 1956. But I’m not sure if that lady is holding the Scarf or the Headscarf. The Scrapbook measured 12 by 14 inch. Not too long ago, the official E.P.E. 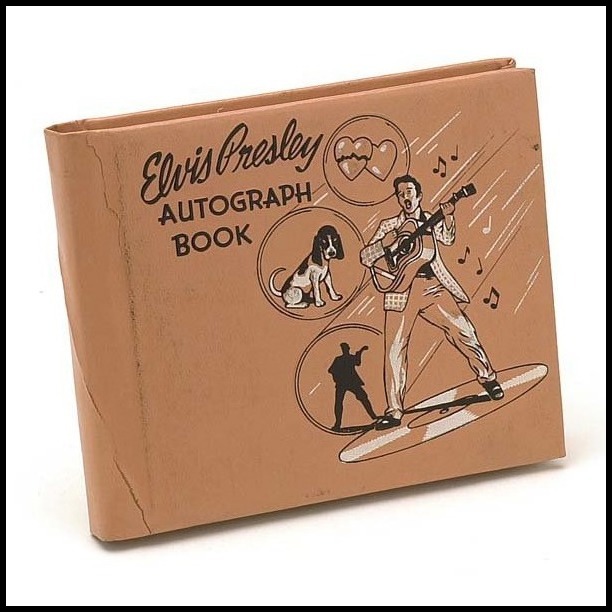 Diary showed up in auction, and the nicest thing about it was that the original owner had actually used it to write down all the Elvis-related news (TV appearances, new records, etc.) from back in the day (and there was a lot of it! ), and it now functions as some sort of time machine. 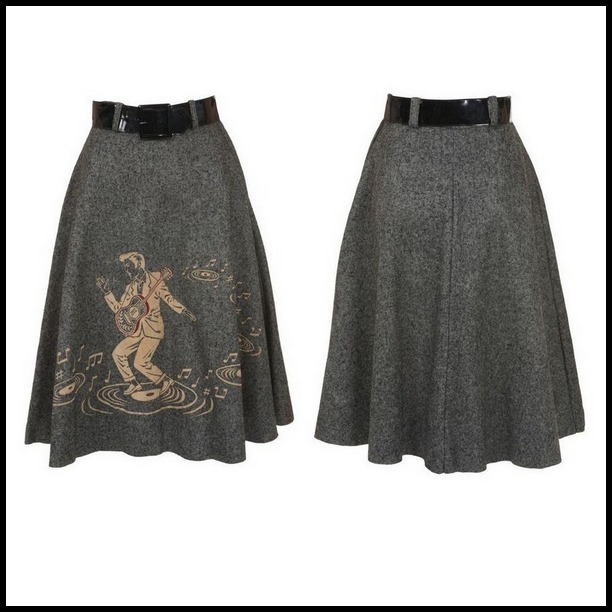 This felt Skirt was available in grey (left) and black (right). And apparently the E.P.E. 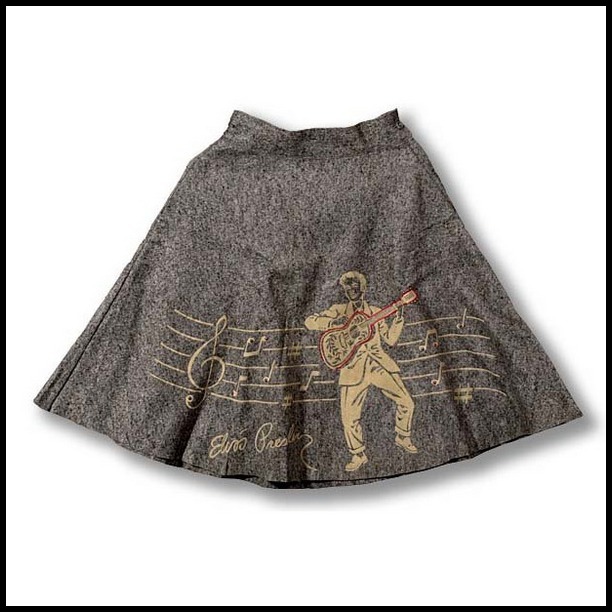 skirt was also available in denim in corduroy. But I have never seen any proof of this myself. It actually came in different designs and sizes, which, again, were available in black and grey. The sneaker was available in two colors: in black + green, and in white + black. 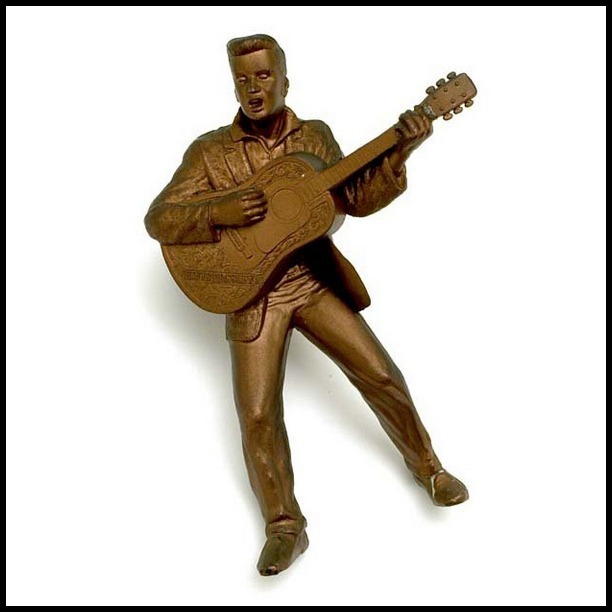 This 7,5 inch high bronze Statuette was actually made out of plastic. 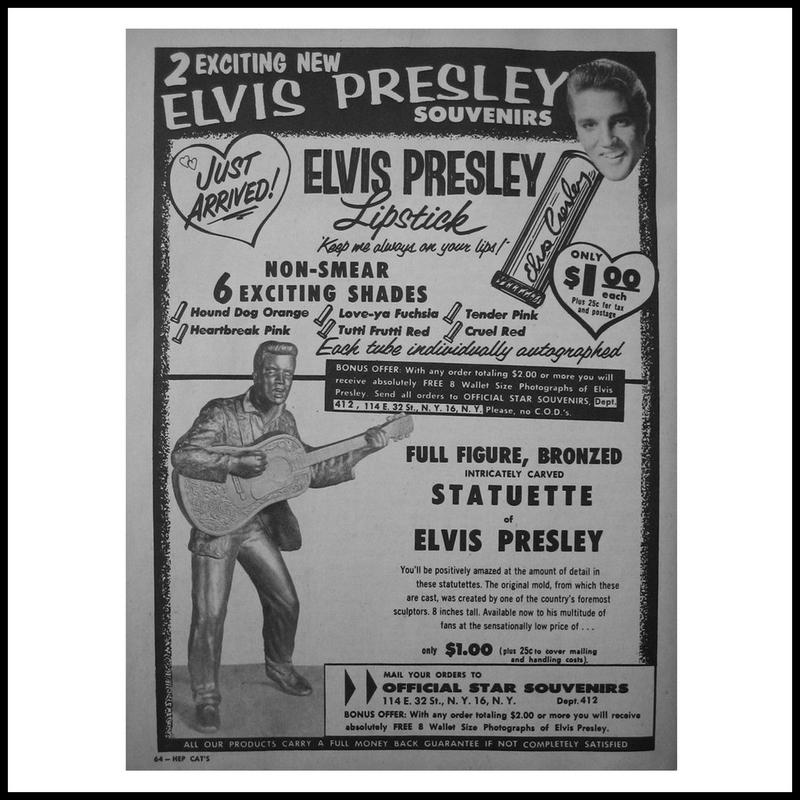 To the right we have a double ad from Hep Cat’s magazine (December 1957) for the Statuette and the Lipstick. Notice how the name of Running Wild Pink (see the Lipstick color chart earlier in this article) has now been changed to Heartbreak Pink. 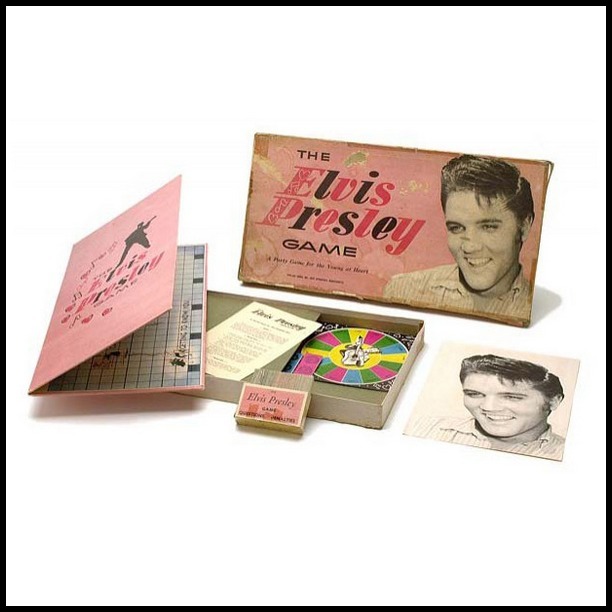 Rare with a capitol R, The Elvis Presley Game is nearly impossible to find. 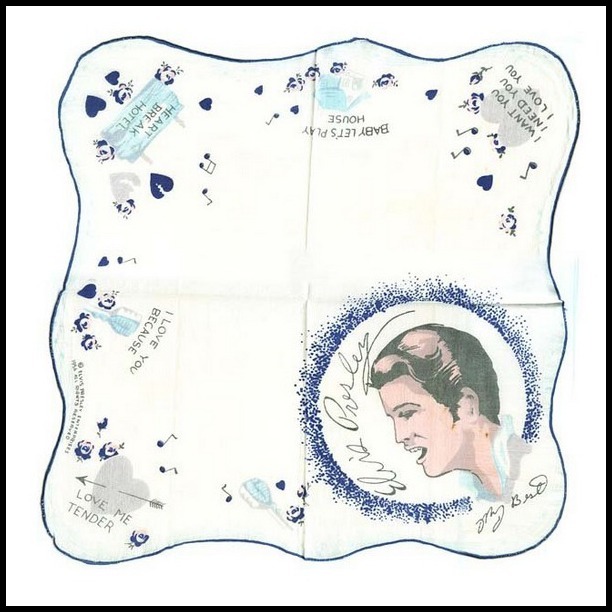 Please check out Ger Rijff‘s cool article on the Elvis boardgame HERE! Another big seller was this official E.P.E. T-Shirt. 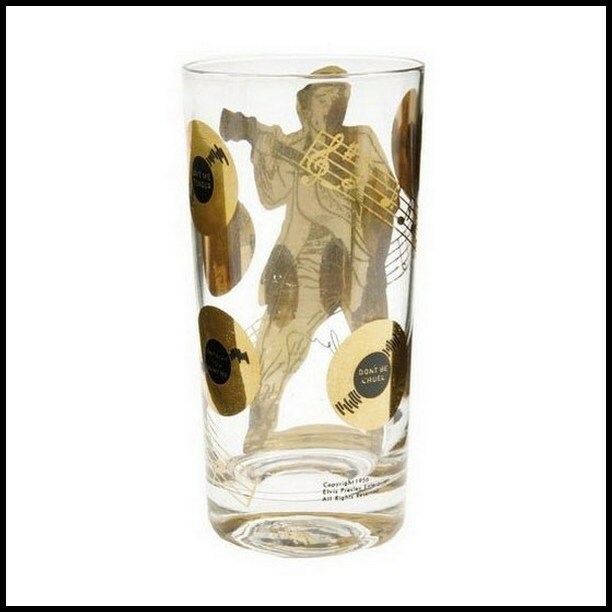 Probably the most popular fan-item for any artist anytime anywhere. 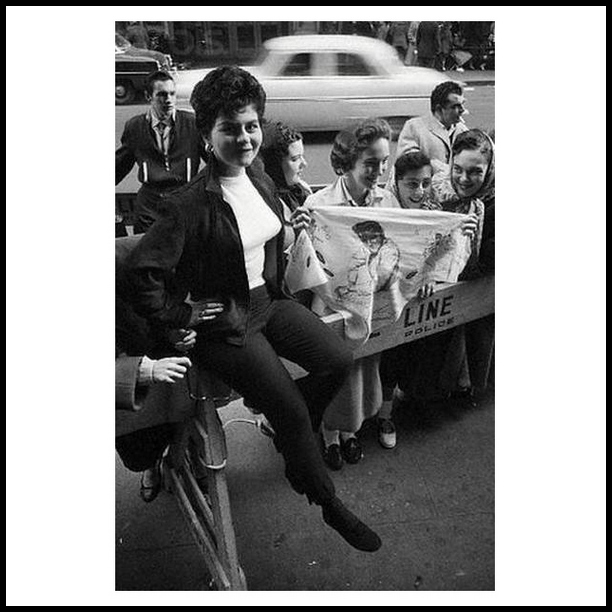 The photo to the right is from October 28, 1956 in New York, outside Studio 50 (home of the Ed Sullivan Show) where Elvis was performing that day. 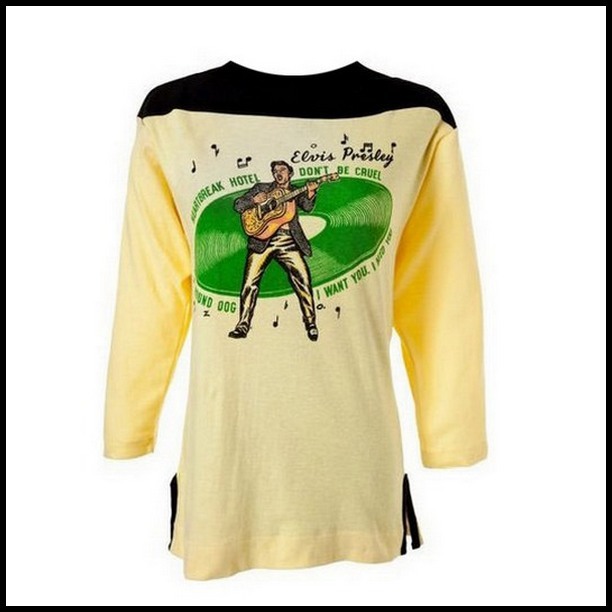 The girl wearing this shirt is also wearing the Love Me Tender Necklace. Not nearly as popular as the short-sleeved T-Shirt back in the day, this long-sleeved Shirt is much harder to trace nowadays. Both T-Shirts are being advertised in the ad to the right. Well, that’s it for the moment. Keep an eye on Echoes for PART TWO, COMING SOON. More E.P.E. merchandise is on it’s way. From a truckload of different Wallets and Purses, through even more Jewelry, Dresses, Pins/Buttons and Mittens (yes, mittens! ), to Framed Pictures and lovely fluffy E.P.E. Hound Dogs and Teddy Bears! * The images of the E.P.E. memorabilia in this article were collected over the course of nearly a year. The bulk of these items have appeared on US auction sites. 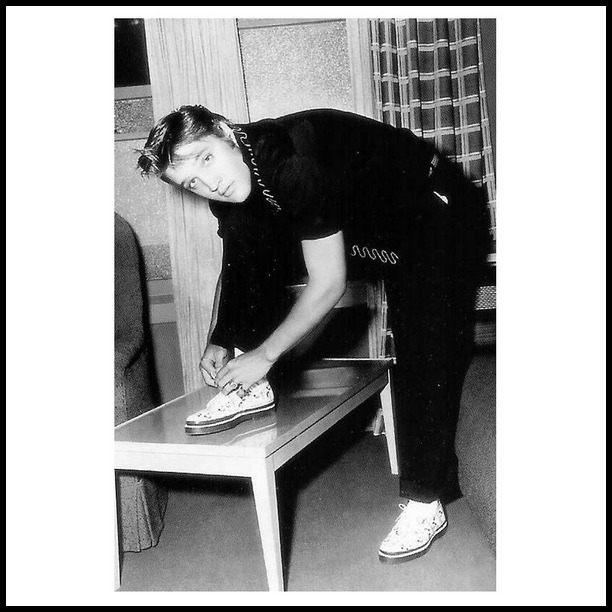 * Credit for the b/w Elvis (+ Elvis-related) photos in this article goes to the original (unknown) photographers. * Credit for the E.P.E. ads that appeared in Billboard, as well as the E.P.E. Merchandise article, goes to Billboard magazine. * Many thanks to KARI PAJU for helping out with the scan of the EPE Ring-ad that appeared in Modern Screen magazine. 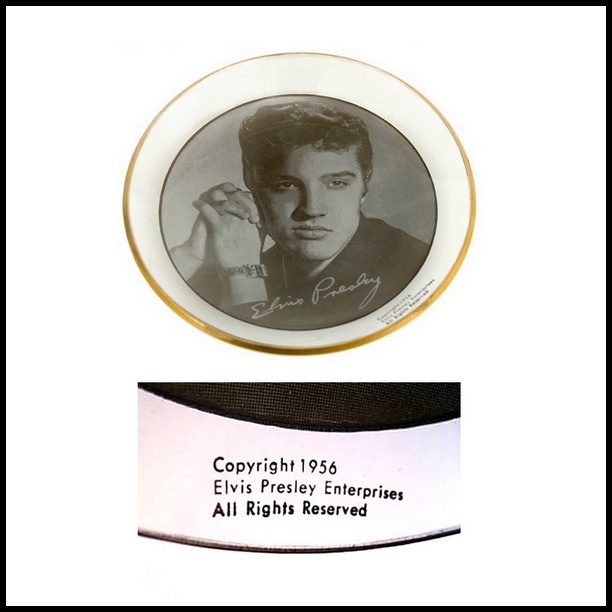 For the text in this article I have mainly used Elvis Collectibles as reference. 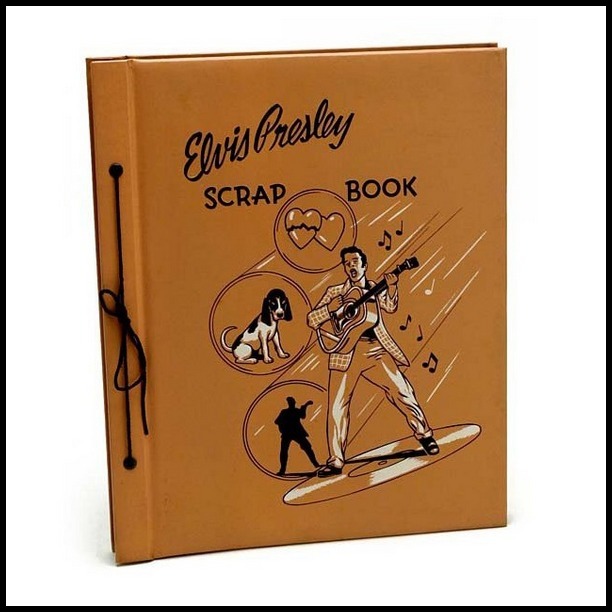 This book by Rosalind Cranor, virtually loaded with black/white images of vintage Presley memorabilia and long out of print (but it can sometimes be found on eBay), comes very highly recommended! This article is dedicated to my original Echoes-partner in crime, the biggest vintage E.P.E.-fan I know, and still the main inspiration for this website: GER RIJFF. No one is goin’ to beat this … I better start looking for a new hobby! Amazing job, Bob! Truely amazing! Thanks for sharing your huge work with us. It’s a privilege to have all of this information just one click away. Along with the record store banners, this my favorite article on this site. I love this stuff! Excellent, very well done! Nice quality. You did a great job, the site looks pretty good. Lot’s of succes. Thanks Bob, fascinating stuff. Statues an’ all. Excellent page! Bob just amazing. 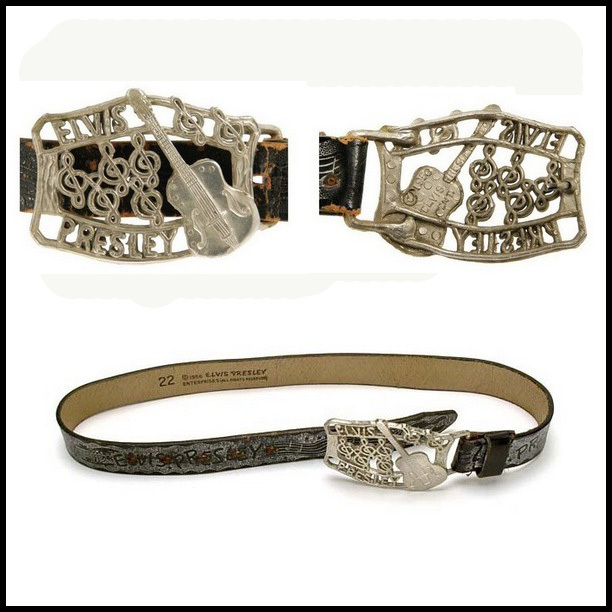 Most of the stuff I’ve seen before in books or on the net, but it’s the first time that I’ve seen a leather belt! 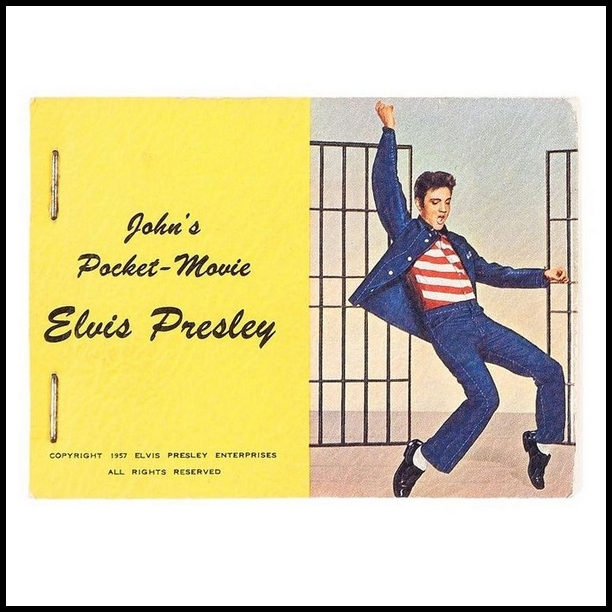 Does anyone have doubts about the flipbook from Jailhouse Rock? There have been a lot of doubts about that item … anyone? 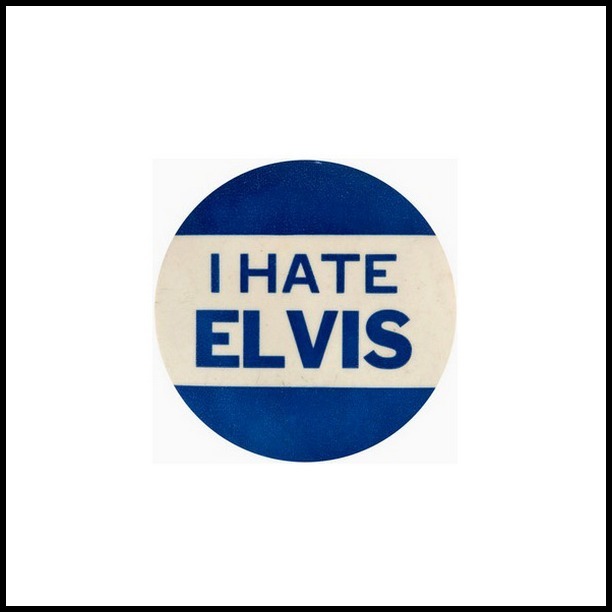 Great website and an even greater tribute to the man who taught Elvis-history to us all. Thanks Bob for this page, and thanks Ger for all your lessons. You’ve indeed been a true inspiration! 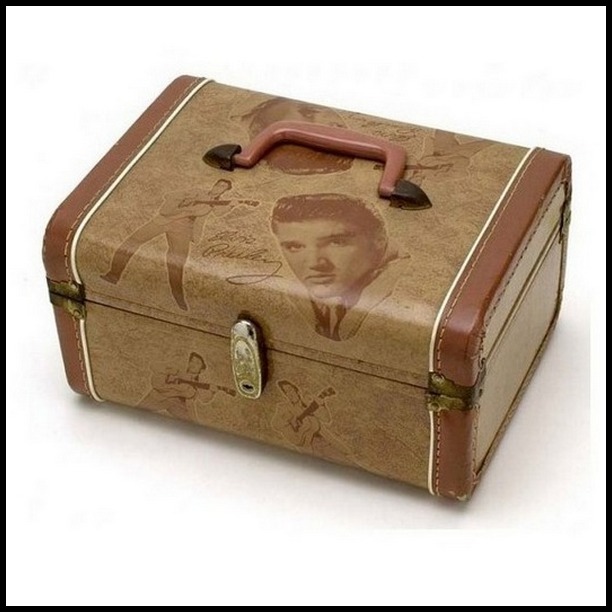 Well, I have a lot of Elvis and have been collecting since 1970, and my Viva Las Vegas fanclub has seen my things. I was in the Seven mag, June 27 2013, look me up Sandra Luther, you will be amazed. 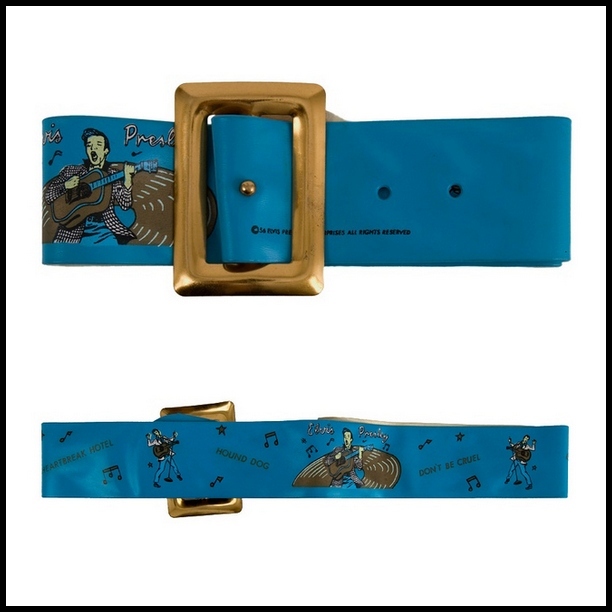 I also wanted to add that in the leather belt collection, there is also a third buckle that was bronze coloured, a bit smaller in size also with a guitar but that looked very different than the two pictured. This site consists of awesome and truly excellent material! I’m really enjoying the design of your website! This is a cool piece! 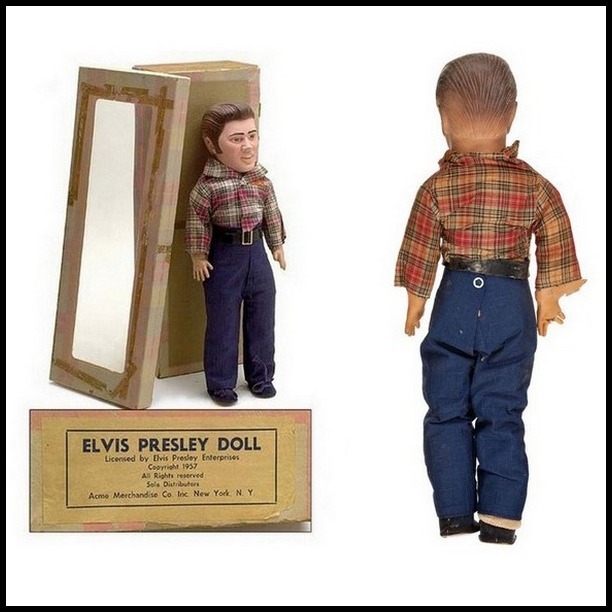 Where can I find an original 1957 Elvis doll? I’ve been searching for quite while and would like to own one. Thank you and I hope to hear back from you soon. Take care. 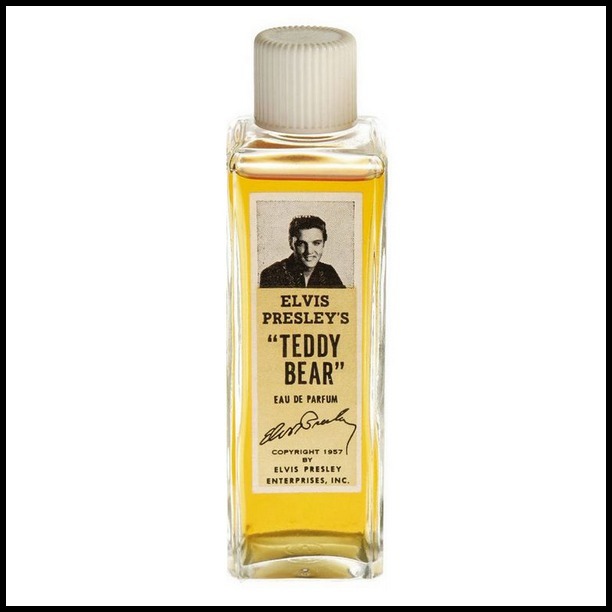 Hey guys, can anybody tell me where I can buy Elvis Presley’s “Teddy Bear” perfume? 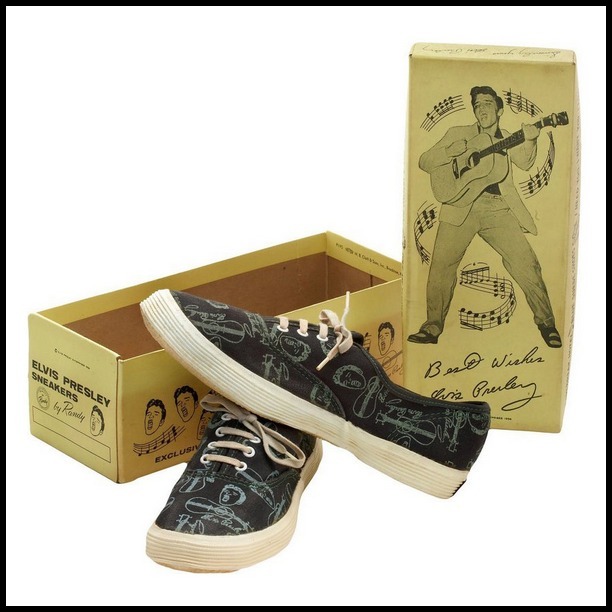 And, interesting to note; The ‘Elvis Shoes (sneakers from 56′) that Elvis is holding and trying on’ are actually black soled shoes, where as the product sold to ‘us’ wear just rubber soled ‘sneakers’. :) He probably got the first prototype. I have a 1956 scrap book in pretty great condition which I’m trying to find the value of. If anybody could help me out that’d be much appreciated. I have a pair of his earrings that are glass dangle earrings with his photos incased. they are stamped EPE and beautiful!! I will send a photo or two if you like. just let me know. 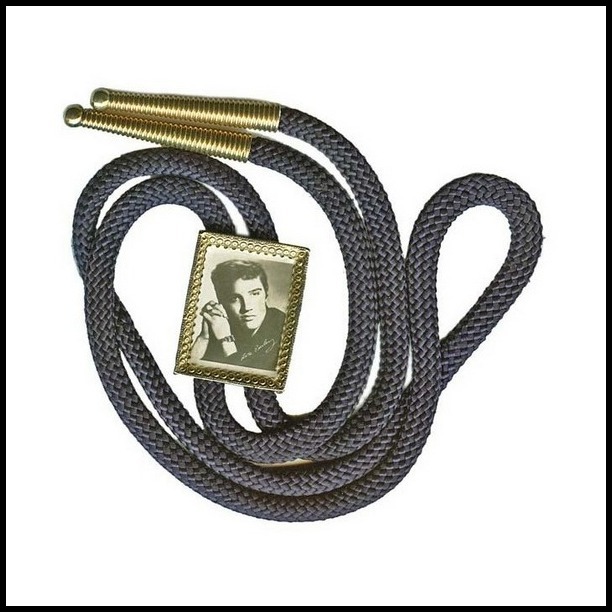 I have a Elvis bolo of pewter. 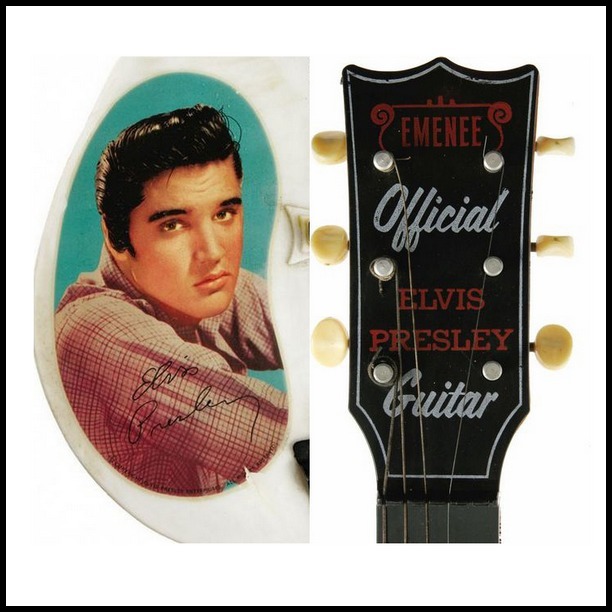 The 3 pic’s of Elvis with guitar & graceland/signed- Elvis Presley. Was wondering what it was worth? I just bought the overnight suitcase on a Dutch selling site for just €45. 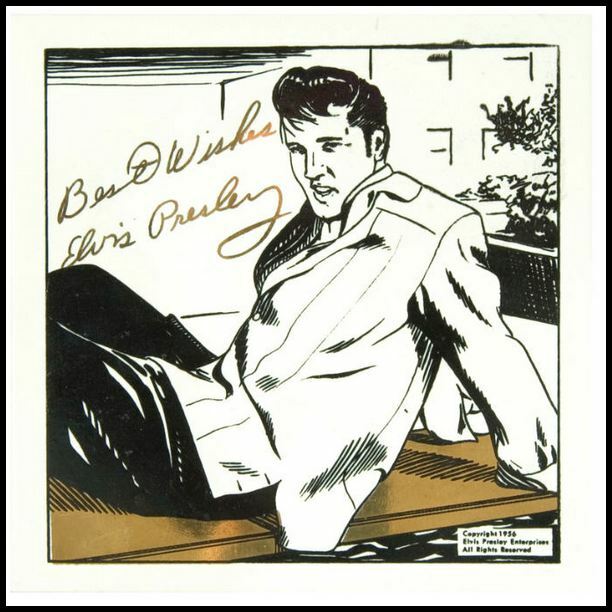 My mum has a 1950’s portrait print of Elvis and was wondering what it’s worth? 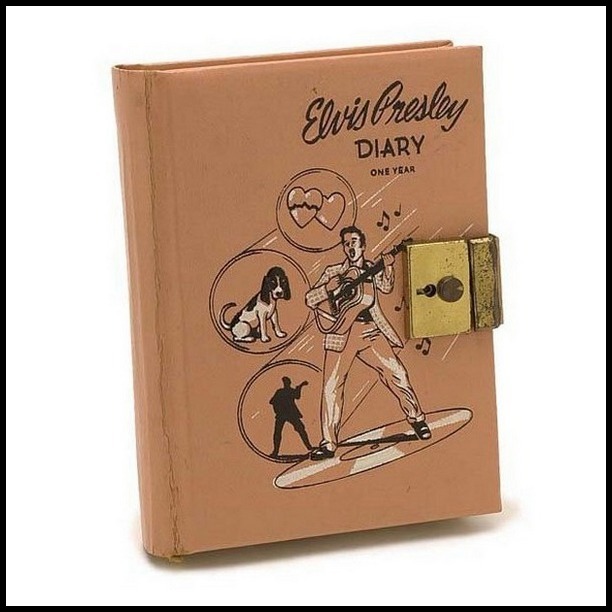 I have a “pink item” Elvis diary from 1956. I have never written in it. What would be the appraised value of it? I know it’s very sought after. It is in excellent condition. Thanks! Beautifully done! Best I have seen. 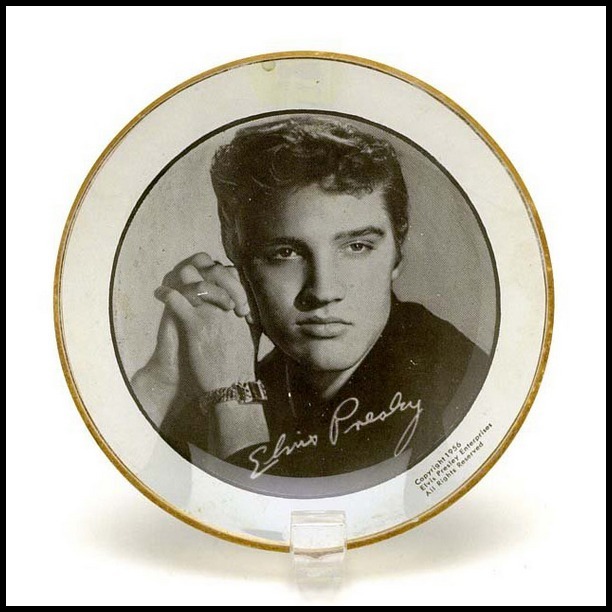 I have a trailer house full of all kinds of Elvis items from the 50’s till 2018. 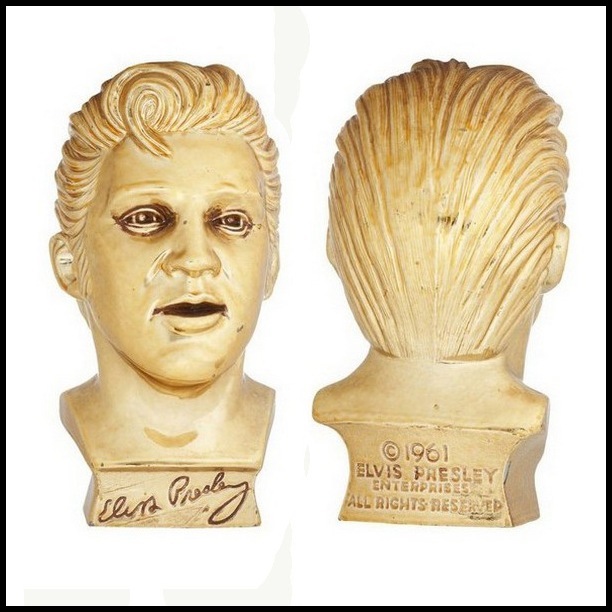 Phillip K.Miller, Rosalind Cranors Collectables book recommends washing the Elvis doll in mild soap (one with a low PH), gently patting it dry then rubbing the skin with baby powder to slow down deteroration, then wrapping it in clean cotton cloth, away from strong light, heat, damp etc. Hope this helps. Did the second part of this article ever come out? 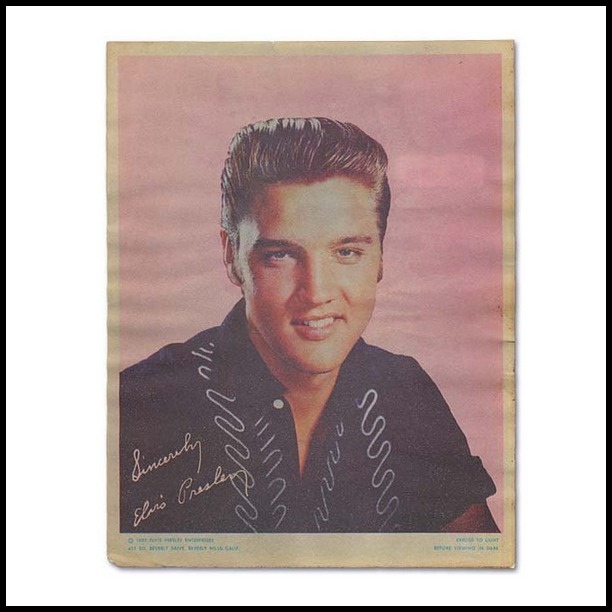 I have a 1956 pink Elvis Scrapbook full of memorabilia, would like to sell. Let me know. 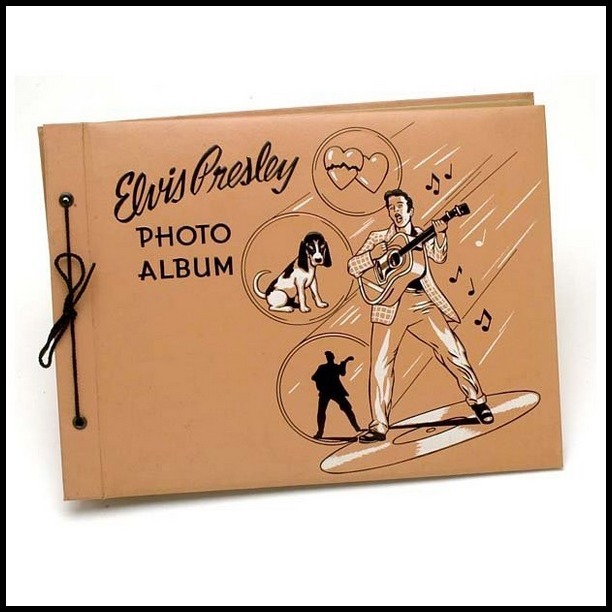 Betty…have you sold the Elvis scrapbook yet? Is there a possibility that there might have been a different shoe style other than the sneakers with the same print? My grandfather in California has some with the same print, however they are hard sole shoes not sneakers. I have not seen them online anywhere, any insight? How much would the overnight case be worth? Great article! My sister’s son got her a plastic Elvis statue at a flea market and we have been hunting and hunting for info on it! I found it here! Thank you! 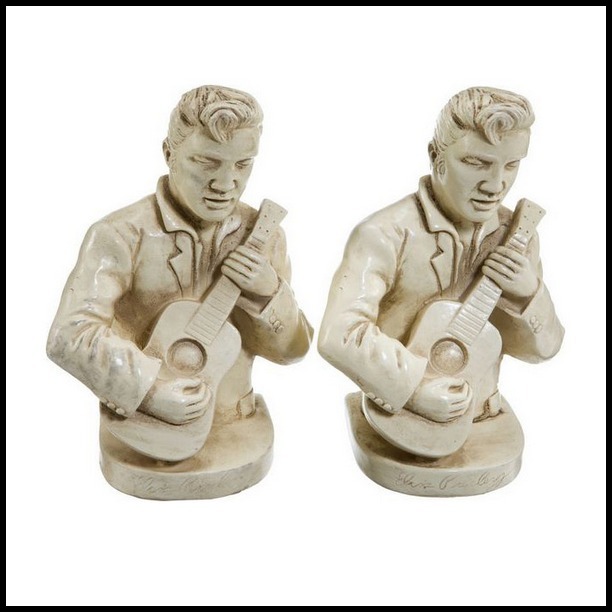 I never realized my Elvis bookend had a partner. I also have the hat with the original tag, a hankie and scarf. 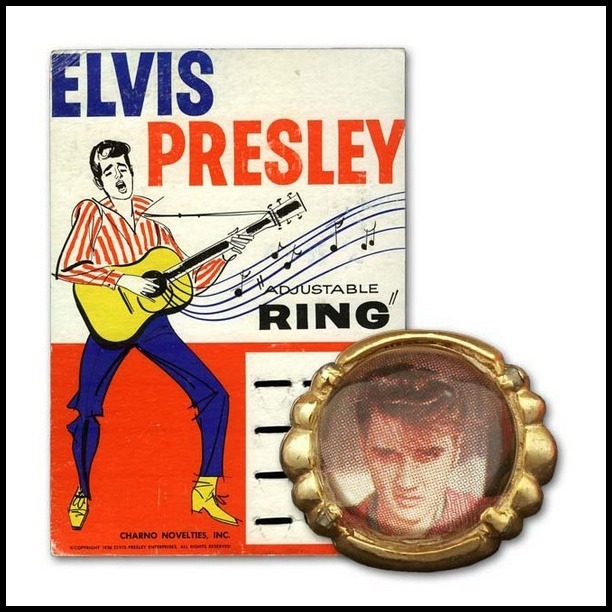 I think my most valuable thing from 1956 is the EPE ring. 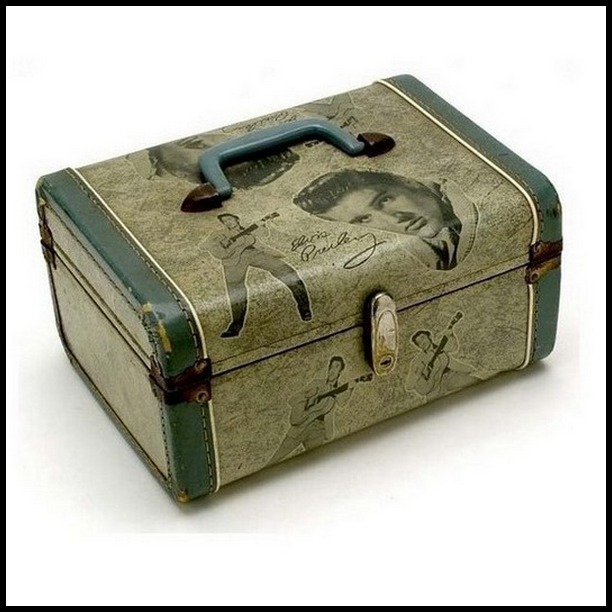 It is the one Elvis himself wore….he took it apart, put in a little pic of him and Judy Spreckles together, placed it over the original pic and gave it to her. I have it framed with a note from her. Would love more items from this historic and amazing time. 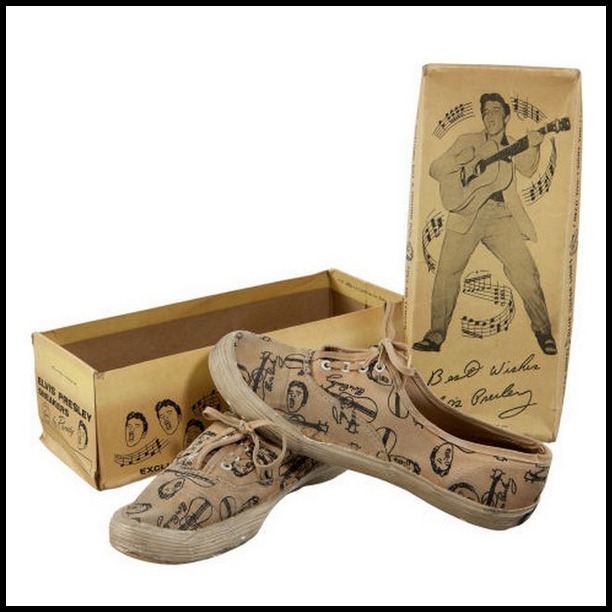 Have a big collection of Elvis … can provide photos. Do you sell any of this memorabilia? Such as the busts and statues? 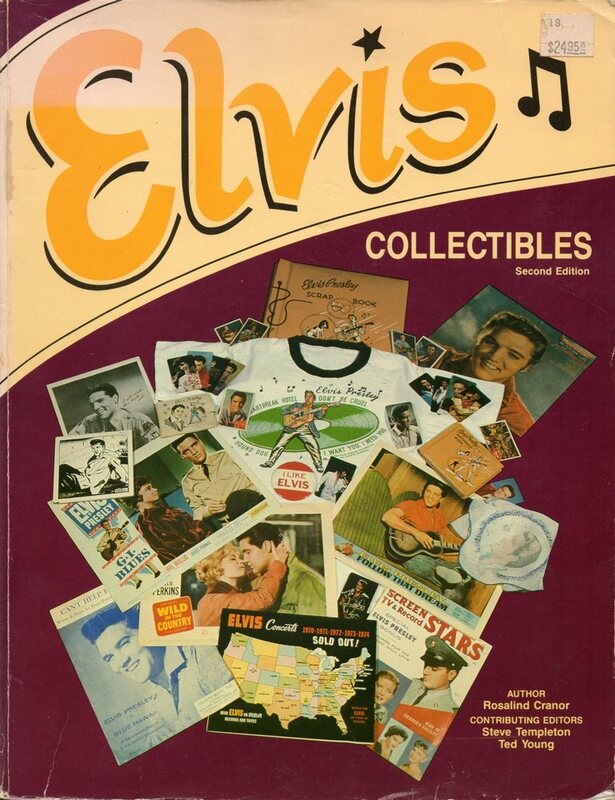 I have an Elvis board game, it sits in a plastic ELVIS spelled out container, I won’t say box because it is not rectangular, it is ELVIS’ name. I have googled and googled and I can’t get any hits … has anyone ever seen this game? Alice, your board game was officially licensed by EPE, and manufactured in 1987. 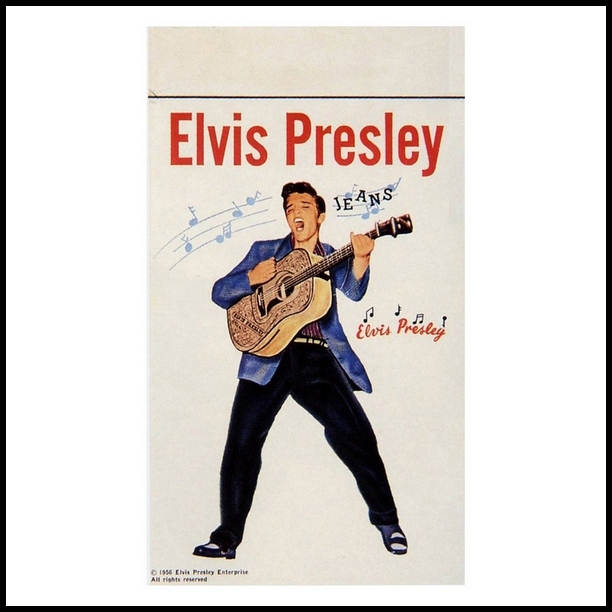 If you type the game’s full name in your Google search bar, “Elvis – The Game That Allows The Legend To Live On”, you will find the info you are looking for. Great, thank you Bob, much appreciated. Hello. 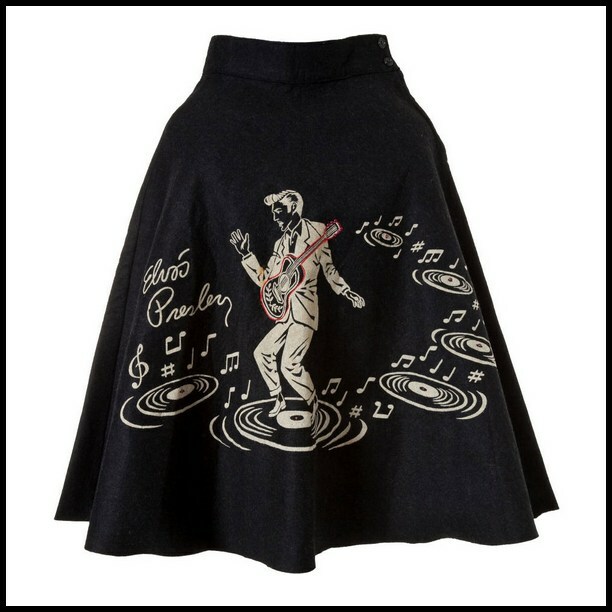 I have my mom’s Elvis skirt with the original crinoline petticoat also. The puzzling thing is that it is turquoise. It has the same design as the black and grey skirts. I’ve searched images and have never found it. Were there different makers of this item? I believe it was purchased in Milwaukee WI. Any information would be great. 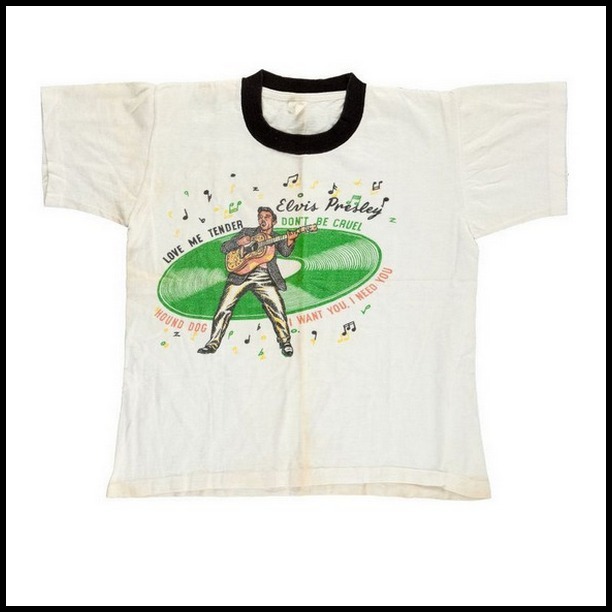 Also have an Elvis tshirt. Cant find images either.